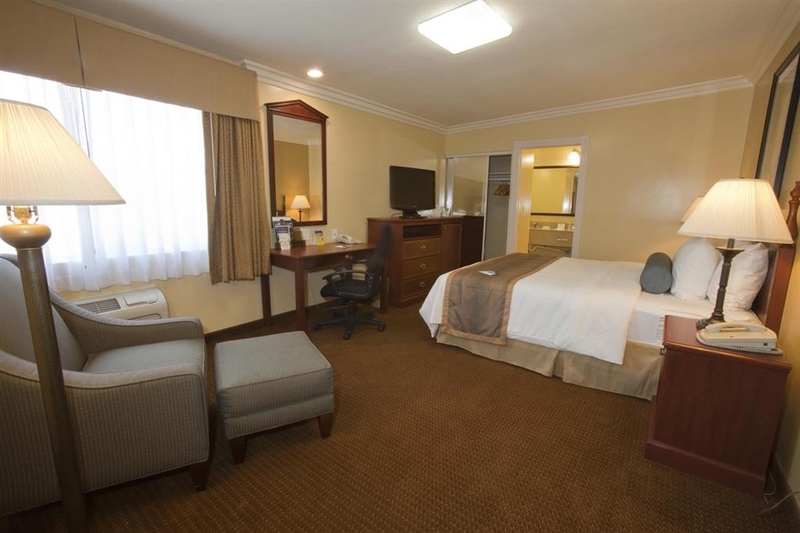 The Best Western China Lake Inn is ideally located in the center of Ridgecrest. Come and experience our hotel near the major tourist attractions. Best price guaranteed and exclusive deals. Sit down in our spacious breakfast room and enjoy the morning new while sipping on a hot cup of coffee. 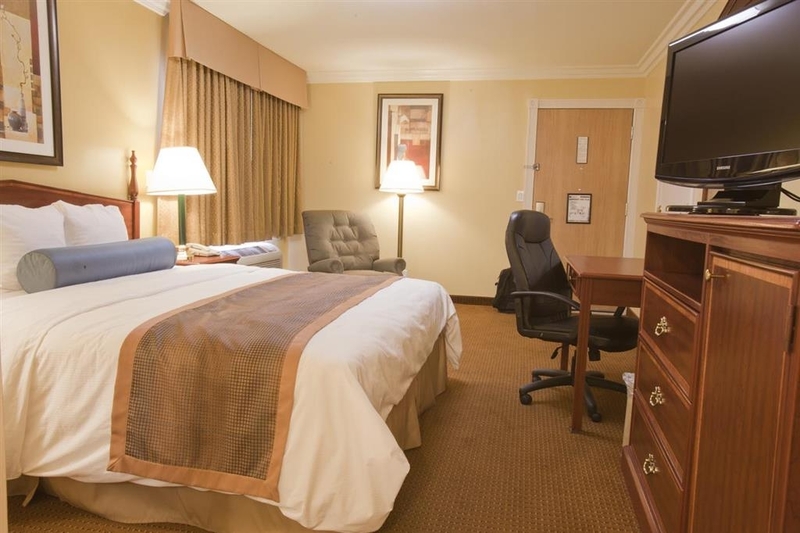 Standard two queen room includes hot breakfast in the morning, free wireless Internet, microwave, refrigerator and full cable with HBO®. Our mobility accessible deluxe guest room offers a roll-in-shower, lounge chair, Wi-Fi, microwave, refrigerator and full cable with HBO&#174;. 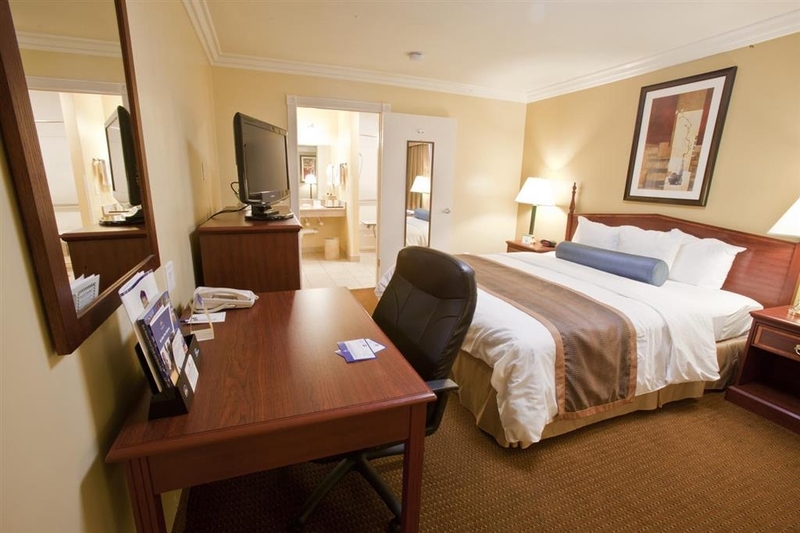 This deluxe room is spacious enough for four and includes a microwave, refrigerator sofabed, and 39-inch LCD TV. 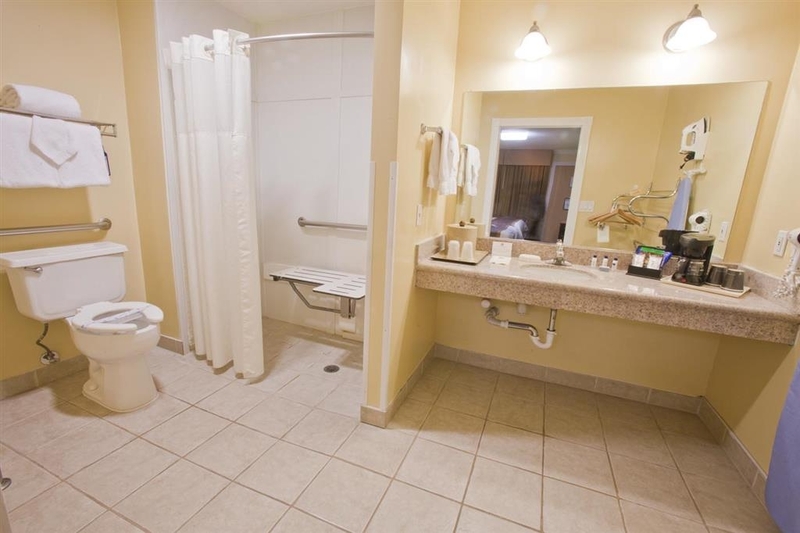 Our mobility accessible guest bathroom has a roll-in-shower and fold up shower chair. 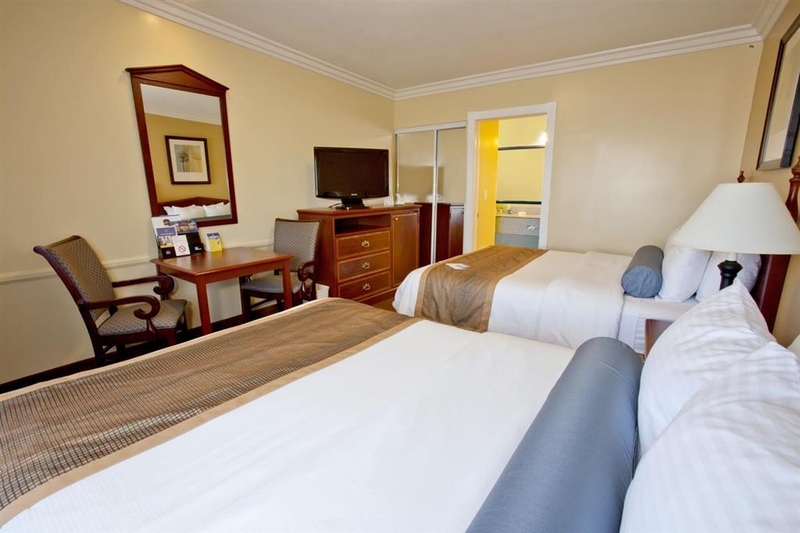 This double standard queen room includes Wi-Fi, microwave, refrigerator, cable with HBO® and 39-inch LCD TV. 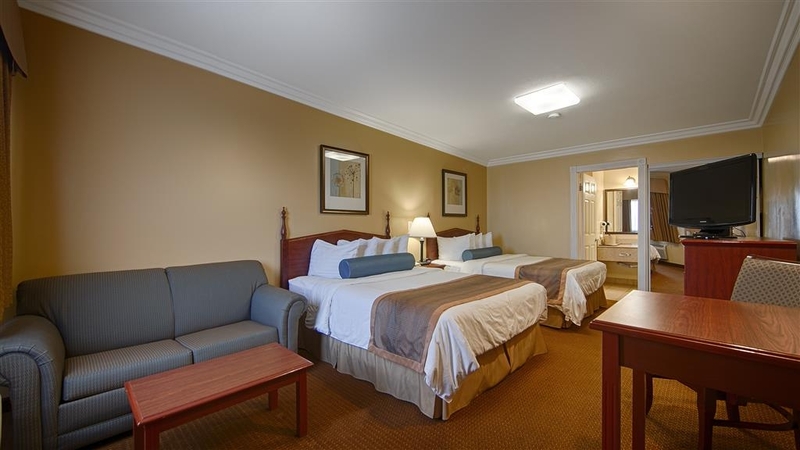 Standard two queen beds guest room with microwave, refrigerator, and 39-inch LCD TV with full cable & HBO®. This is our standard king room which includes an ottoman, chair, foot stool and work desk with business chair. 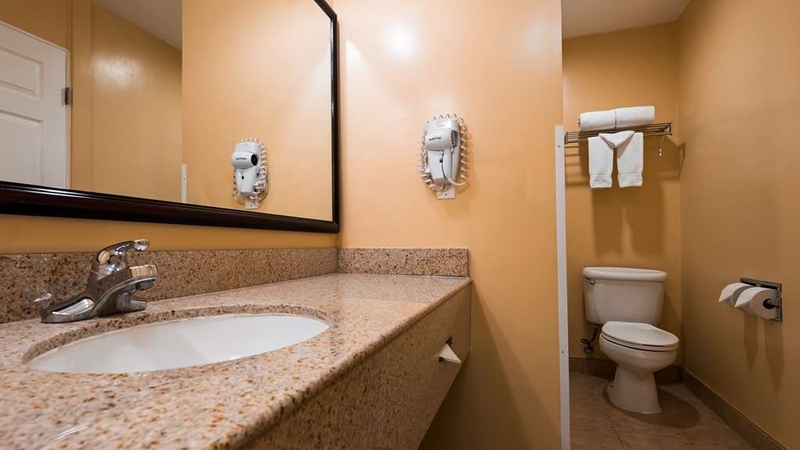 Our bathroom vanities have plenty of space for your amenities and more. Standard king room with free Wi-Fi, in room coffee, microwave and refrigerator with 39-inch LCD TV, with full cable & HBO®. 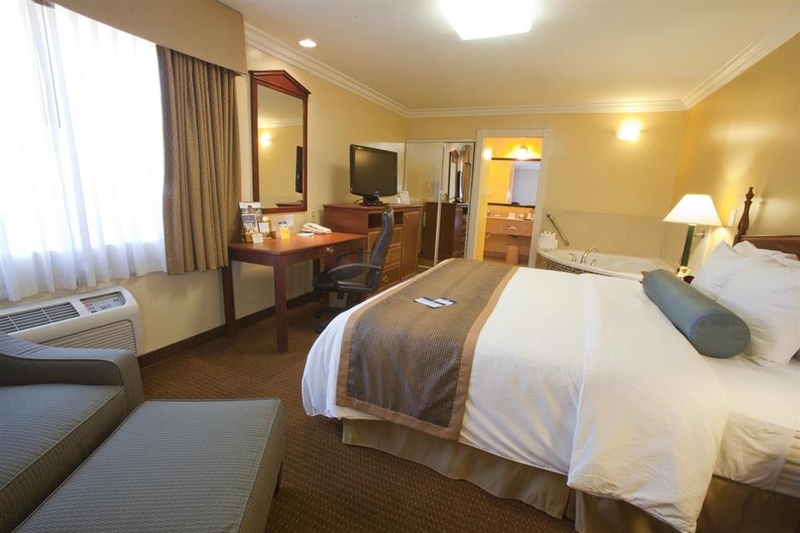 Standard king room with free Wi-Fi, in-room coffee, microwave and refrigerator, with 39-inch LCD TV, with full cable & HBO®. King bed with Jacuzzi&#174; &amp; ottoman chairs. 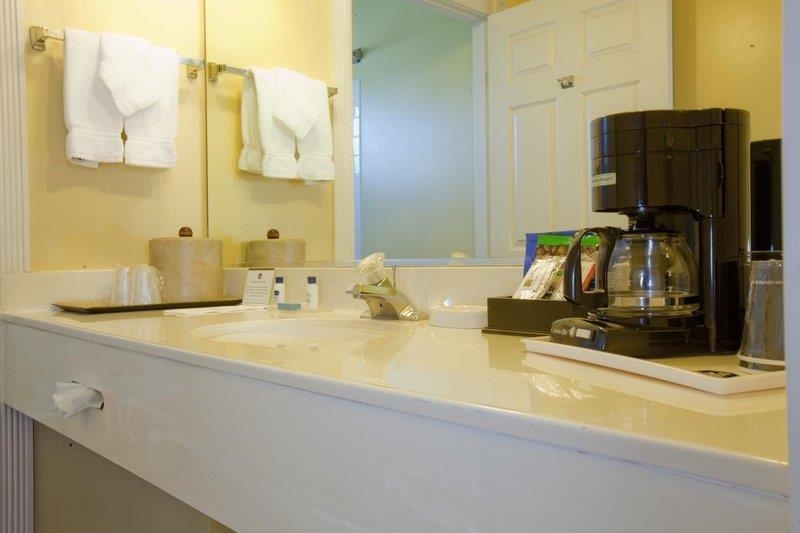 Free Wi-Fi, in-room coffee, microwave and refrigerator, with 39-inch LCD TV, with full cable &amp; HBO&#174;. King deluxe room with large Jacuzzi® tub & 39-inch LCD TV, ottoman chair with footstool and desk. 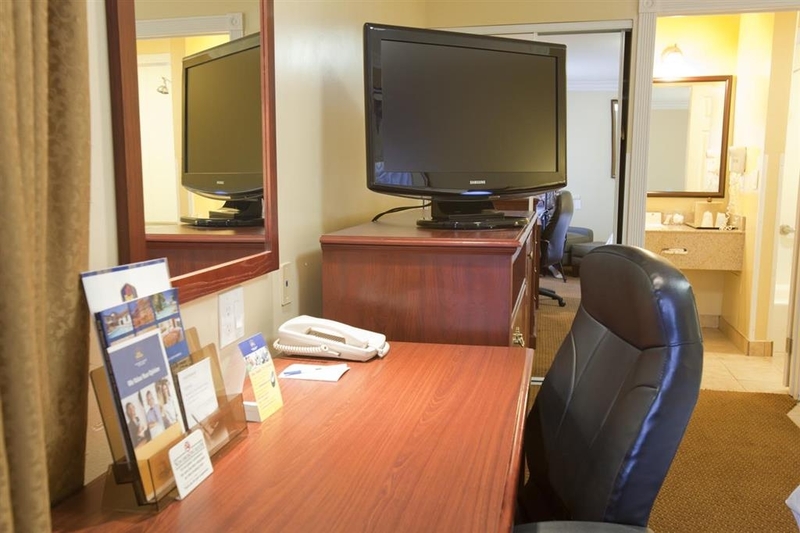 Our large double queen business room with desk and sofa and chair includes a 39-inch LCD TV with HBO&#174; and cable. 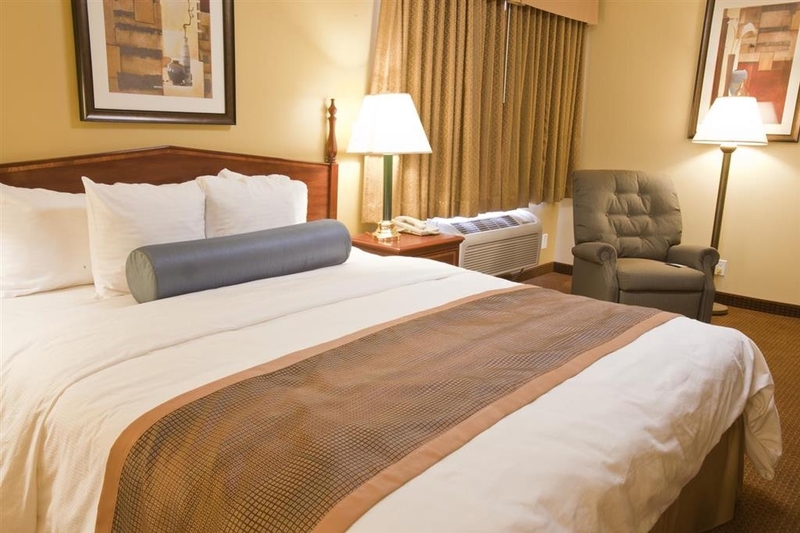 Double queen room: ultra-comfort beds, sofa for two, chair, complimentary breakfast and beautiful view of our High Sierra Mountains. 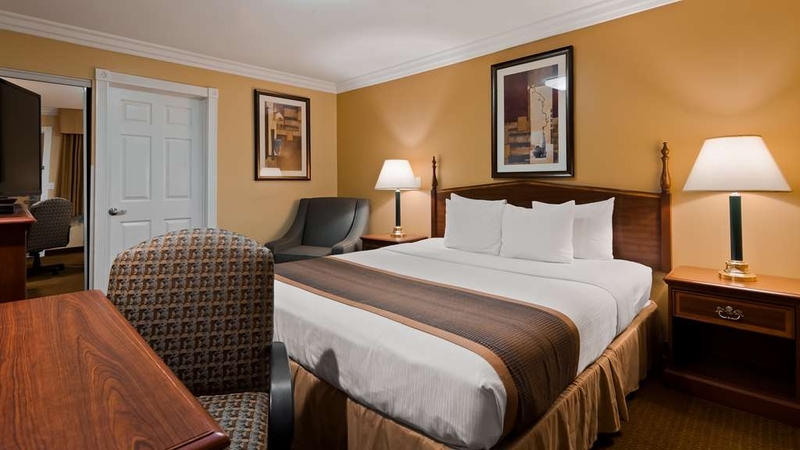 Our standard two queen bed room or suite with free Wi-Fi, in-room coffee, microwave and refrigerator with 39-inch LCD TV with full cable & HBO®. 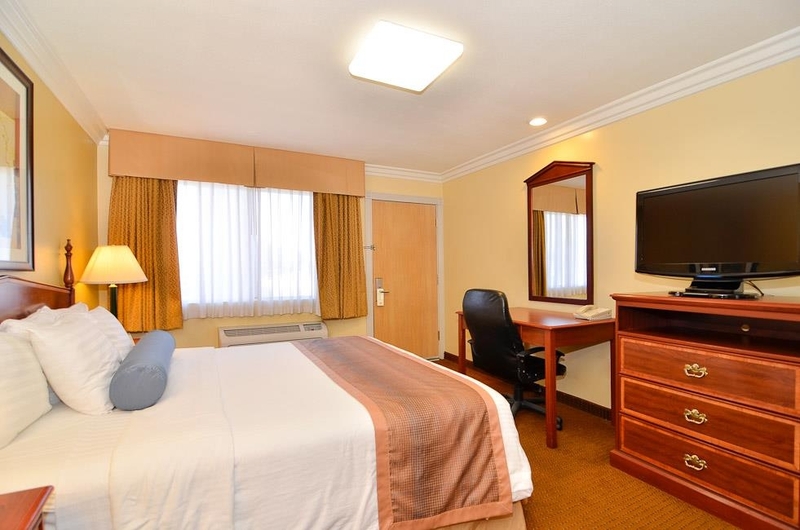 Our standard king room includes an ottoman and desk, Wi-Fi, microwave, refrigerator, with 39-inch LCD TV with full cable &amp; HBO&#174;. 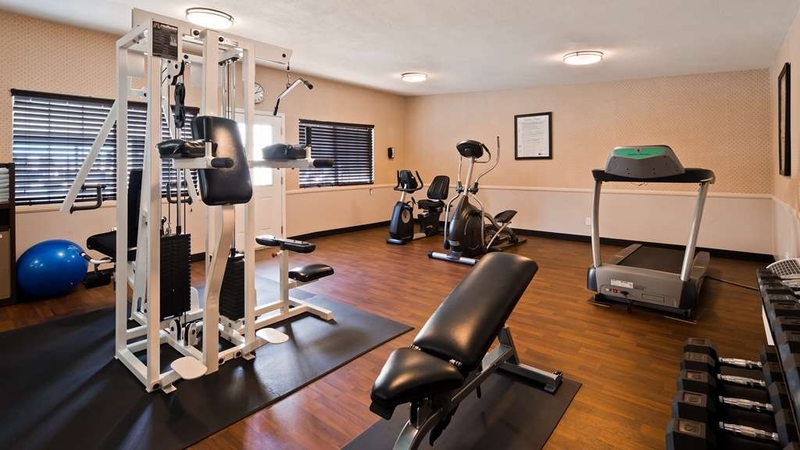 Stay at this clean, friendly hotel in Ridgecrest, California offering free full breakfast, luxurious rooms, a fitness center. a Jacuzzi® and a non-heated swimming pool. The Best Western China Lake Inn takes great pride in offering attentive customer care to every guest traveling through Ridgecrest. Hotel guests will find it the perfect stopover when visiting nearby Death Valley National Park, Lake Isabella, and Red Rock Canyon. A true California Dessert Experience. Travelers often stay at China Lake Inn for a variety of activities including touring local ghost towns, whitewater rafting, fishing and hiking. Military personnel will be close to the China Lake Naval Weapons Center. 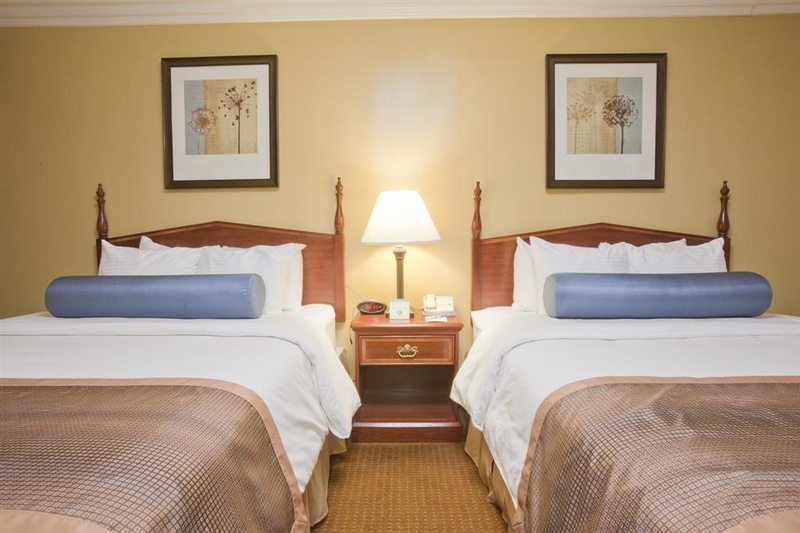 The hotel offers spacious guest rooms featuring all the right amenities including flat-screen cable television with HBO®, microwave and refrigerator, free wireless high-speed internet access. A complimentary full breakfast is available each morning. Additional hotel amenities include an outdoor swimming pool, Jacuzzi®, fitness room, meeting room, business services and free parking. Enjoy your stay. We stayed in this hotel one night before going to Death Valley. Our room was clean and comfortable. The staff was cordial and the neighborhood was quite. The breakfast was nice, but the cutlery were in plastic, not only is it a waste but moreover it is really not practical to eat with. Rooms are decent enough and comfortable. As someone who travels 200 days a year for work, $110/night for a mid level economy like a BW in Ridgecrest is nothing short of a ripoff. I know there's a captive audience in town so they can charge what they like. But that's gouging the consumer. The room was clean, the bed comfortable. The grounds were a bit dated, as was the room. There was a jetted tub in the room (not the bathroom) which was out of order. Until late at night, I would have given this place a higher rating, but about midnight, someone moved in above me. The creaking in the ceiling when they walked around woke me from a sound sleep, and I wondered if the ceiling was going to fall down. Again, at 5:00 in the morning the pipes woke up and spoke. Very noisy. I expected more for the price. The breakfast was "food" according to my husband. We stayed one night on our trip from death valley. We were not impressed by this hotel. The room size was ok, but outdated furniture and an unpleasant smell. The carpet had lots of stains and felt sticky. In addition you shouldn't look to close behind the bed or in corners - as the cleaning personal also has a blind spot there. The breakfast was also not very inviting. "If you like sleeping, then this is not the place!" Do you have insomnia? Then this is the place for you! Do you like to pace around your room for hours on end? Then this is the place for you! Do you like to hear every sound within a half mile radius? Your room is right this way! Does a full 45 minutes of sleep leave you fully recharged? Your room number is 121. Like static and blurry tv? Please check in today! Want to wait in line for 30 minutes to check in? Great, they have a room ready for you! Are you a normal person that likes to sleep, in peace after a long day of work or vacationing? Then don't you dare chose this hotel. Is the price $50 per night? Nope, not worth it. $20 per night? I think I'd prefer sleep! They are paying you $100 per night? Hmm, might be worth it to take the money and sleep in your car. We had a wonderful stay here. Upon arriving the lady at the front desk told us we had been upgraded to a room with a pull out coach and two queens just because they saw we had 3 people. It was so thoughtful and unexpected. The hotel wasn't packed so you didn't have to worry about loud neighbors or having troubles finding parking. The breakfast was delicious and the beds had a comfy pillow top. The staff was very friendly as well. If I lived in California I would definitely go back frequently when visiting Death Valley. If I ever do go back this hotel will be on my list of places to stop in. Thank you Compass59905986589 for leaving feedback. 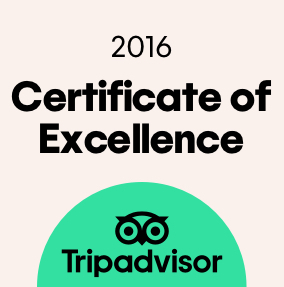 We are glad to have given you the experience everyone deserves. Have a safe trip and happy new year. "Overnight Stop on Way to Death Valley"
We stayed at Best Western China Lake Inn for one night en route to Death Valley. We were given a room on the second floor. The room was standard, with amenities including lotion, shampoo, conditioner, ear plugs, coffee, and wifi. The property has a pool and a hot tub on site. We were impressed by the free breakfast in the morning; it had a good variety, including hot foods. Staff was super friendly. Parking is free. Thank you Susie1028 for leaving feedback. It is always great to hear how we are taking care of our guest. We are always looking for ways to keep improving our guest experience. Have a great week. We had a bad experience. My husband wrote to the manager, and also Best Western. An apology from BW and promise of checking this hotel further. No reply from the hotel of this date. Problems: Room with 2 queen beds so small that there was no place to put a suitcase, leave alone 2. Cockroach in bathroom. Dropped a pill on carpet by desk and found filth and accumulated debris on floor and baseboards. The most serious: the frame for one bed was too large for the mattress. Found that out when getting in bed... it injured my husband pic attached. It was hidden from sight by bedskirt. On checkout, price for room was reduced by 1/2... should have been full refund! We apologize for not meeting your satisfaction. We have doubled are pest treatment since that time. We are in the middle of our renovations which the whole rooms will be redone from ground up. Thank you again for bringing this to light as we use all feedback for future guest. I hope you will try us again in the future after our renovations as our property is not accustomed to getting this kind of feedback. If you decide to try us again after renovations please speak with the manager when making your reservation. Courteous staff, great hot breakfast with professional attendant. TV reception with below quality, at least in my room, I always stay at the Best Western in Ridgecrest because of it's staff, its convenience, it's price and it's breakfast. Thank you gondolfoz for leaving feedback. It is wonderful to see positive experience at our hotel. We are currently looking into our cable options. Thanks again for leaving as we use all responses to further the guest experience. Thank you rwwoo for your feedback. We are at the end of our remodel which the rooms are the going to be fully upgraded, along better lighting and everything. While we are getting ready to start this process, we are looking to see what people are saying. We use all feedback to deliver an outstanding product to our guest. Thank you for your time and hope to see you on future stays. I found this facility by accident by touring through the city of Ridgecrest. The staff was courteous and helpful checking in and out. I had a problem the night before at a different BW facility; the front desk clerk listened and placed me away from crowded areas and was able to get a good night sleep. The clerk also helped in choosing a dinner place in the town.. I am so glad Michael to hear how our staff is taking care of our guest. We always do our best to help each and every guest with there needs. We will see you on future stays. Thanks again for choosing our establishment for your lodging needs. Thank you Willpgee for taking the time to leave feedback. We strive for superior customer care for every guest. The staff and I thank you for letting us be your place to stay and we will see you on future stays to Ridgecrest. Have a great weekend. "Excellent hotel for the money"
Ridgecrest, where I went to high school is in the middle of the Mojave Desert, and exists only because of the China Lake Naval Weapons Center that is there. My wife and I stayed here for my 50th high school reunion, and the service was great, the rooms were clean, everything worked. The complimentary breakfast was more than adequate. And when the people next door woke us up with a drunken argument at 1 a.m, hotel management got right on it and solved the problem in maybe five minutes. Will definitely stay there again when we retirn to visit my sister and her family, who still live there. Thank you so much Roy S. The team and I are glad to hear you had a wonderful stay. Thank you for choosing our establishment and by the end of the year we should have our rooms renovated. Have a great week and we will see you in the future. Great value! Comfortable, clean rooms! The staff was beyond helpful and super sweet. If you cannot take stairs, make sure to get a first floor room as there are no elevators. The breakfast room gets crowded so plan accordingly but the food is great. Thank you for leaving feedback Summers_Mrs. It is good to hear that your stay was enjoyable. We will see you on your future stays. as a prior traveler stated, 2.5-Star Motel... but $100+ price tag booked a standard queen room, check in was drama free, clean room, and typical ammenities. so why not a 4th star? bed was OK, droopy on the sides (queen shared w/ my wife), small-ish pillows, TV was tempermental, and room was just very dated, all around... so i guess i have higher expectations for over $100 after taxes and fees? if the price was less, say $75, i'd feel like i'm getting what i paid for, but for a single overnight in Ridgecrest i guess i can't complain? Thank you PinotMe for leaving feedback. We are in the final stages of our renovations which is the rooms. Everything will be converted (including mattress). We expecting to be done before the end of the year. Thank you again. Friendly check in, reasonable sized room, comfy beds. A little noise but nothing too annoying. Small pool for guests and nice to have breakfast included- pretty basic but did the trick. Classic motel style hotel, no safe in room but safety deposit box at reception. We paid 120 dollars for the night, no extra for parking , wifi was free and it included breakfast for all of us so all in all was okay. Ridgecrest itself isn't a particularly nice place, just a stopping on the way through kind of town. Thanks for the feedback PeaLomax. It is great to see your reservation was good. We are always looking to improve guest experience. Have a great day. The hotel itself is nice and clean. The rooms are pretty standard but well kept. The gym was nice and had quite a bit of equipment for the size of the hotel. The pool area is clean and nice. What makes this stay the best was the staff they are very friendly and helpful. I get a good morning enjoy your breakfast each morning and a friendly hello any other time I see them. I will stay here any time life brings me this way. Thank you Phillip J for leaving a review. We are always looking to enhance the guest experience by these reviews. We are happy to have provided to you great service. Have a wonderful day and we will see you on your future trips to Ridgecrest. "The Best 2.5-Star Motel in Ridgecrest"
I travel to China Lake Naval Station many times each year, and stay in the town of Ridgecrest. 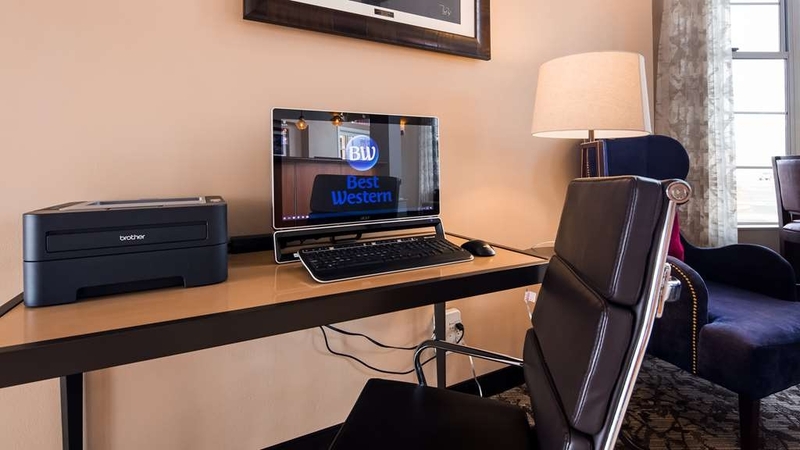 I have stayed at most of the motels, whose rates are in per diem of my company, and Best Western is my #1 choice. The breakfast is tops of all the motels in town (where room entry is on the outside/parking lot). It is fairly clean and has friendly check in staff. They have a pool and adequate fitness room. The only complaint I have is the motel-style draws a good deal of noise from events happening in the parking lot. It is not uncommon for impromptu get togethers to happen in the parking lot, where people congregate to smoke, drink, and have a good time. With no complaints against these things individually, it does create excess noise given that the entry to each room is next to the parking lot. Thank you for leaving feedback KG D. We are always looking to enhance the guest experience. Have a great day. I do apologize for any problems you encountered why you were here. We are always looking to improve guest experience. We also have a maintenance person on call 24/7. Again I am sorry and we will use this as a training opportunity. Thank you and have a wonderful weekend. "Great motel, staff and breakfast." We was there for 3 nights, and it was a great motel. The staff was friendly, and the breakfast was very good. Theresa and Yesenis worked at the front desk, they were extremely nice and very professional. Thanks Cathy for taking the time to give us your experience at our establishment. It is always great to hear that our staff is taking care of each guest. We will see you again should your travels take you to Ridgecrest again. I stayed here recently for 1 night. The room was a good size, and the hotel is in a good location in the town. A complementary breakfast is provided, and this was also good. Staff are friendly and helpful. Thank you WorldTraveller1313 for leaving feedback. The team is always happy to know that we are taking care of our guest. Have a great week and we will see you on your future travels to Ridgecrest. "Nice Motel... A Bit Pricey"
The Best Western China Lake Inn is a more than decent motel in Ridegecrest. Really comfortable bed, excellent wifi, good tv, ok air conditioning, and the usual breakfast of make-your-own waffles, cereal, etc. I will give a shout out to the staff at check-in - it was fast, smooth, and pleasant. I would definitely stay there again, despite the less expensive options in Ridgecrest. Thank you for the review. Our renovations will be done before the end of the year with the rooms. Thank you for taking the time to leave feedback and we will see you on your future journeys. "Good a/c and good breakfast"
This place is a good value. The a/c works great, the room was quiet, and the breakfast included biscuits, sausage and gravy, eggs, waffles, lots of choices of cereal and yogurt. Microwave and fridge in the room. Thank you CR1717 for your response. The team takes great pride in customer service. It is very pleasant to hear that you enjoyed our amenities. We will see you on future stays. Thank you for your review. We will see you on your next stay. Nice quiet room for the night. Friendly staff that go above and beyond. Good breakfast in the morning. 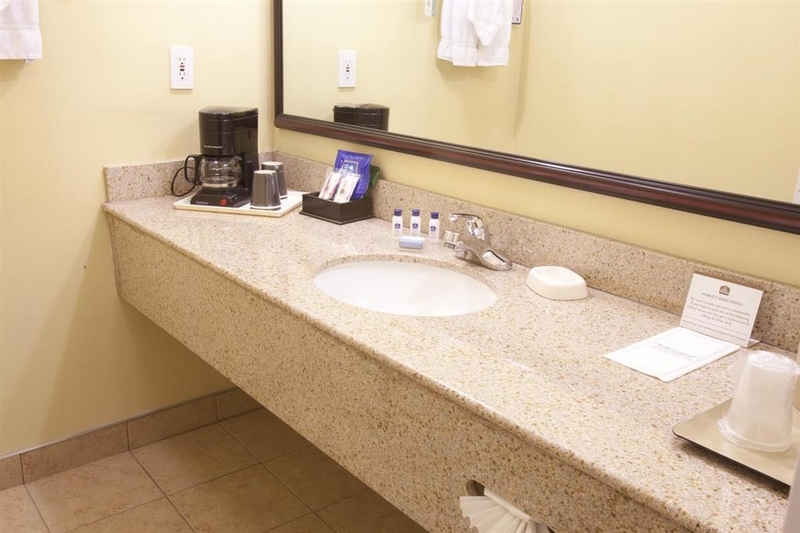 Room has all the amenities you need for the night. Parking was easy in this lot. There is street parking for RVs or trucks with trailers. Thank you for your feedback. We use all feedback to further the guest experience. Have a great weekend. "Pluses slightly win over the minuses"
Thank you for taking the time to leave feedback. We value all response to further enhance the guest experience with superior customer care. Have a great day and thank you. we stayed here because we did the petroglyph tour so we needed to overnight. as far as that is concerned this place fit the bill - nice room, relatively quiet, clean. the staff was very helpful and friendly, especially Tina, who advised us on what place to eat at (we asked for her opinion on Mexican fare). as for the free breakfast, you'd be wise to stick to the fruit selection and a bagel. the warm foods were essentially inedible, from the turkey bacon, scrambled eggs (yuck!) and biscuits. we would stay here again if we return to Ridgecrest, but we'd eat breakfast somewhere else in town. Thank you Al G for leaving feedback. We are always looking to improve our breakfast and variety. We use all feedback to further the guest experience. Have a great day. We enjoyed the stay, nice people, nice grounds and clean and quiet rooms. The breakfast was pleasant, coffee nice and hot. The lady that checked me in even sang happy birthday to me. I will stay again when I go visit my son. Thank you for choosing us as your one stop. We pride ourselves on customer service and am glad you received the hospitality that we are known for. Have a great week. "good hotel near death valley"
Clean room with daily service, pretty good breakfast. good location by the main road, many good restaurants near by. (A good choice is Tokyo House for dinner) .Best deal and value hotel to stay if you going to Death Valley! Thanks for the response Henry. I am glad to see your stay was enjoyable. Thanks for taking the time to let us know how your stay was. Have a great week and we will see you next time. "Clean and on the way to Death Valley"
Came here to stay on the way to Death Valley which was a couple of hours away. Nice sized town for these parts with mountains in the background. The room was a nice size with comfy beds, bathroom was a decent size. This hotel has 2 floors and "motel like" where you park in front of the door. They offer a basic breakfast ( included). Staff was very nice and helpful. Thanks Vicki for leaving feedback. Our rooms are on the renovations list along with our never ending search for the right breakfast. Have a wonderful day. We stopped for a night on our way to Death Valley National Park. The front desk staff was great in taking our reservation and ensuring we had what we needed. We asked if they had any info on Death Valley and recommended we come back when the front desk staff changed at 11pm as the night staff was very experienced in the park. He provided some excellent recommendations for us. Rooms were small, but clean and comfortable. Complimentary breakfast was very good. Thank you so much Beancounter4 for leaving feedback. We use each one for furthering guest experience. It is always great to hear that our staff is taking care of each one of our guest. Have a great day and we will see you on your next trip to Ridgecrest. Stayed here on a stop to Death Valley. The staff here was so friendly and welcoming. The woman that checked us in gave us a map and was very helpful. The breakfast room attendant was also very helpful and always made sure we had our needs met. The room was decent size, with comfortable beds. It was very clean. Would definitely recommend for a stop over! We thought the hotel was fine, nothing special but comfortable, though the room seemed a bit small. Breakfast would fill you up if you were in a hurry or trying to save money but you're unlikely to enjoy it. Better option is anything you like on Yelp as everything in RC is close by. Our main purpose of writing review is to warn that although we booked here because TA said it was pet friendly, we had to smuggle our little dog in because at check in we had to sign on the line acknowledging that we weren't supposed to have pets. "Good location, loud sleeping rooms"
I would not go back because of the noise from the nearby road and more importantly from the surrounding rooms. The room didn't smell terribly clean, the breakfast food was subpar. The front desk staff was polite. For a small town this Hotel is unusually clean and well maintained. Breakfast is warm and fresh and always plenty of food. The staff is amazing both morning and evening shifts. We stay here often and are treated the same way each stay. Thank you for your repeated stays with us. It is nice to hear that we are consistant and it is good. We are part of a group and planning an event in Ridgecrest. We have over 80 members. 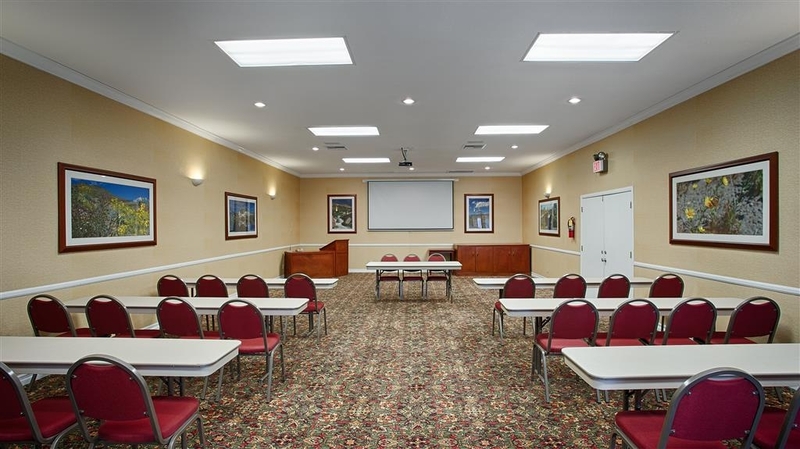 Best Western has a very good location close to the facilities where we will be meeting. The staff are excellent, including kitchen staff and housekeeping. Parking was convenient and safe. "Our REGULAR home away from home"
This is the only hotel we will stay at even prefer here over the suites on the Navy base there! Theresa treats us like family when we call in our booking and every time we see her while we are there at the hotel. I reserved and paid weeks in advance. Exhausted after driving 500 miles, knowing there wasn't anything available I spent two minutes in my room here before leaving and loosing my advance room charge. I just couldn't bring myself to stay in this dirty hotel. Never again. Not knowing your name, we are unable to try to find out what happened. We do try to work with our Guests to find another room within the hotel. Our housekeeping staff and maintenance work hard to keep our rooms clean and safe. We are going to be remodeling all our rooms this year. Room could also be cleaner and up to date. Bad room with bad / shower but very small and old fashion. The service is kind & helpful. Breakfast was not a big experience. Gym is good and small bud clean swimming pool, jacuzzi was under refurbishment. Thank you for staying with us. 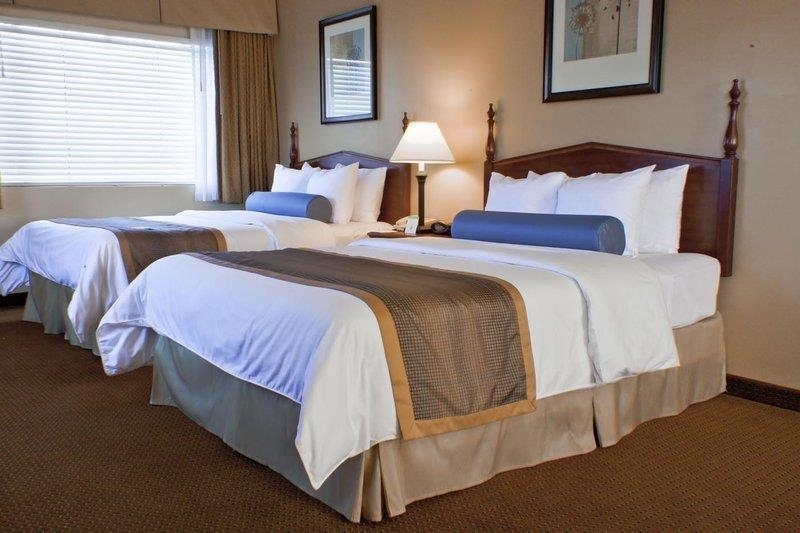 Our rooms are inspected after our housekeepers finish cleaning the rooms. There might be a stain, but, our rooms are clean. We are going to be remodeling our rooms over the next year. "Good hotel, nothing special, just plain and simple." Stayed here for a couple of nights, was generally a good stay, rooms a little dated but they were clean. Don't expect anything special though. 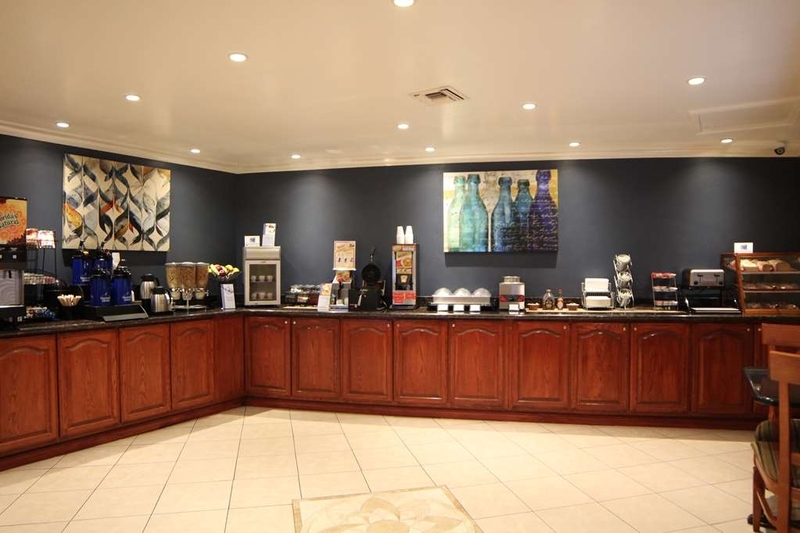 The staff are friendly and the breakfast area is clean so as a stop off hotel its very good. Thank you for your recent stay at our property. We were happy you did have a comfortable stay. We are going to be remodeling all our rooms this year. We hope to see you in the future. "Nice enough for what I needed." The employees were great - friendly, great service, etc. The room was fine, clean, smelled fine. The breakfast was much better than expected - had much more variety than expected and it was nice. The road outside was a bit noisy at times, but not bad. All in all it was a comfortable and pleasant experience. Thank for staying with us. Thank you for your GREAT review. "position and overall service ok"
Position is ok, but the rooms at 1st floor are noisy, especially those facing the main road and next to the reception building. Nice fitness center and pool. Breakfast is ok. Room space is ok. Beds are ok.
"Nice little oasis in the middle of the desert"
I've stayed at this BW a couple times before, and always had a wonderful expieriance. Very friendly staff always very helpful and acomodating. Location is on the main blvd but sits back far enough so to maintain some privacey. "Clean and Comfortable Spot in the Middle of the Desert"
Not as nice as some BW hotels but the room was clean, the bed was comfortable, and breakfast was satisfying. We had some noisy neighbors but that's not really the hotel's fault. I'd definitely stay here again if I were passing through the area. Hotel was very clean and the room was very quiet in spite of being on the ground floor and right next to one of the main streets through town. Staff was very nice upon check in and check out. Only a couple of problems, 1. the free Wi-Fi log on and pass word did not work and they didn't offer me the "goodie" bag upon check in that usually goes to Gold/Platinum members. Other that that I would stay here again and recommend it to my friends/family. Thank you for staying with us. We appreciate your compliments. We're very sorry you did not receive your "Goodie" bag. "Emmett, Pat, and Tina are the best!" Wonderful breakfast and overall sweet staff! Will recommend again! Tina at the front desk was so helpful, and Emmett was amazing, helping us with lifting heavy luggage, even without us asking him for help! Pat the manager was just great, and the lady serving the breakfast was so sweet and helpful. Kimmie K thank you for your feedback. I am glad that the staff has taken care of you as we work together in every aspect. It is always nice to see that we are taking care of our guest. May you have a great week and we will see you on your future travels. An excellent place to stay. 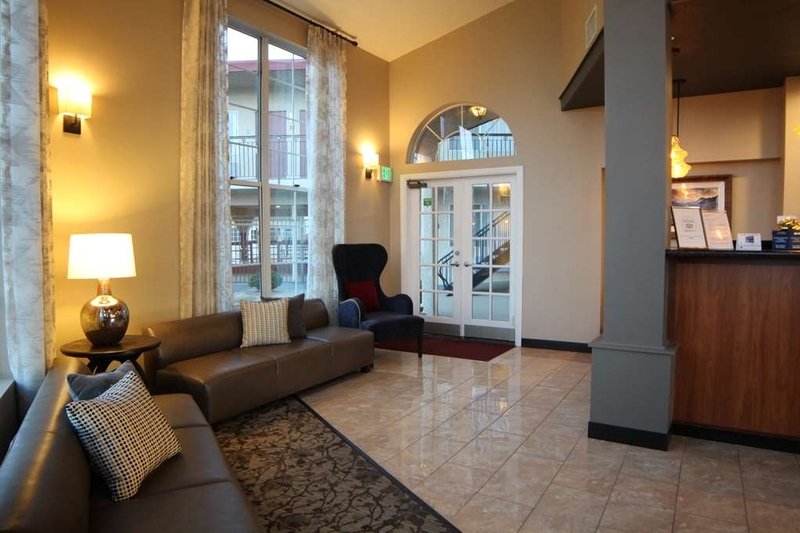 Comfort, Quiet, great location, all the amenities, great Staff. & great price. We always stay at this hotel since the military base raised their rates for Bachelor Quarters. It was convenient to shop on the base & get cheap gas for our Infinity. Thank you for comments Homer B. We take great pride in our customer service. I am glad to see that you have gotten the service we are known for. We will see you on your next trip to Ridgecrest. Have a great day. Room was on first floor. The room was nice enough, average size, clean, smelled good. We settled in for night and people above us stomped and jumped most of night. Swear they were practicing judo up there. Hotel on very busy Main Street and road noise lasted entire night. When I was in bathroom I could hear conversations in the next room and also their TV. I strongly suggested they get better soundproofing. One other matter, the fitted sheet did not fit the bed. It was like it had been put on wrong. Other than sheet and noise, hotel was good. Yes we would stay there again but definitely will be on top floor and further from the road. Thank so much Jhs43079 for leaving valuable feedback. I do apologize for the second floor as we will be looking into the issue when we start the renovation of the rooms. Have a great day. We enjoyed a restful night. The staff at check in was very helpful and pleasant. Nice and clean room, up to date. We enjoyed a full breakfast with Bacon, Sausage and scrambled eggs, there were lots of other options as well. Our grandson enjoyed the strawberry waffle with sprinkles! Thank you so much Lisa C for leaving your feedback. We use all comments to better the guest experience. The build your own waffle is one of our specialties and we will continue to give the great service that everyone deserves. 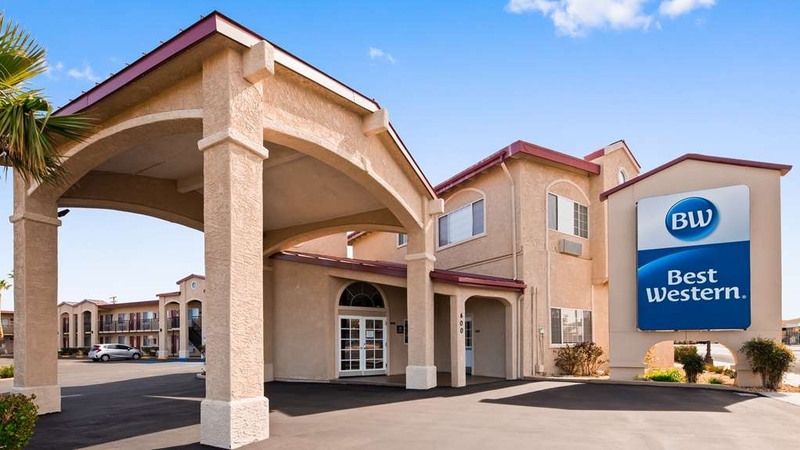 "An excellent stay at Ridgecrest, CA Best Western"
We had never stayed at this Best Western and I never do reviews, but want to highly recommend this hotel. The staff is outstanding and you start your day off with a nicely varied breakfast in pleasant surroundings. The bed was comfortable, the food was good and the staff was helpful. Will definitely stay here again. Thank you so much S892DTedwardm for leaving valuable feedback. This is the great service we are known for and are glad that you had the same experience that every guest deserves. We will see you on your next visit to Ridgecrest. Have a great day. Excellent . Everyone smiling, helpful, knowledgeable and really cared we were there staying in their hotel from the person at the desk and even the person in charge of the breakfast room. We would stay there again. Look forward to having the same treatment from all Best Western hotels. The people in Ridgecrest, Ca were outstanding. SandymR1204NI, let me start by saying thank you for taking the time to leave a response. The team and I try to make every guest feel like they never left home. We were glad to accommodate you and will see you on your future travels. This motel was a clean and quiet area.Staff was friendly and very helpful. Felt fairly safe in motel location. Not much to do in area within walking distance, not very many restaurants in area. You had to go approx. 1 to 1 1/2 mile to everything. Thank you so much for leaving your feedback S2737ZLkevid. It is great to hear that we were able to accommodate you. I hope you have a great week. "Favorite franchise but not this hotel"
Clean and quiet two story hotel with fitness center, a set of washer and dryer, swimming pool and breakfast bar. nice and clean inside but couldn't help smell the musty smell. free breakfast but only tried imitation eggs and sausage links and bacon in small amount and coffee. there are only a set of washer and dryer. for the washer, it says require $1.75 but must insert $2.00 to start the washer. Internet is so slow not recommend for watching movie. This is an older hotel but clean and great staff. 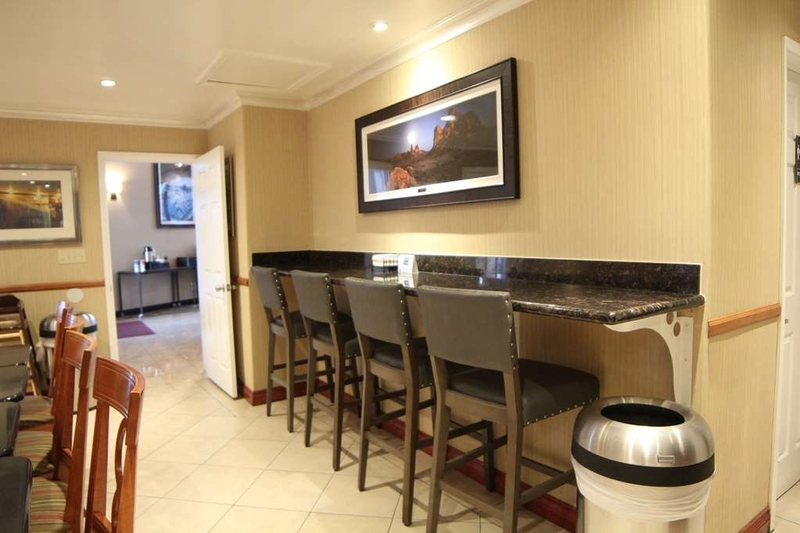 Rooms are clean and sufficient; breakfast area clean and provides standard continental breakfast. We have stayed here before and may stay here again; only drawback was that rooms need to be updated but was still comfortable; price was good. Thank you so much 405kerij for taking the time to leave valuable feedback. Just to let you that our rooms will actually be getting a face lift by April 2017 or sooner. We will see you on your next trip to Ridgecrest. I was very pleased with the quality of service, room and all amenities at the Best Western China Lake. The staff is very helpful and caring, as for places to stay when on travel and getting home sick this place is great for making you feel better about being away from family and friends for an extended time. Thanks to the entire staff Great Job!!! Thank you so much Debra Kay Jordan for taking the time to rate us. The team is always trying to make our guest feel at home and it seems like we did just that with your stay. Have a great week and we will see you on your next trip to Ridgecrest. The staff at this location are the best and the overall experience was excellent. The room rates are very competitive, location is easily accessible, I would recommend this location to anyone traveling to this area. Thank you Z5658NWrichardh for leaving comments. It is awesome to see we are delivering a great product and accommodations to our guest. Hopefully we will see you again if your travels come to Ridgecrest. Have a great day. "Better than average for Ridgecrest, but more expensive than it should have been"
Ridgecrest was a good stopping point for us between Death Valley and Sequoia Nat'l parks. The good parts of this hotel were that it was convenient and easy to find, and the breakfast was very good. The not-so-good were the cost ($220) and the quality of the room. Unfortunately very hard mattresses and clearly an older accommodation that had been partially updated. For this price, I'd recommend the Springhill Suites just up the street for much higher quality. Seemed like this one should have cost more like $100/night. Wifi was free, but not much good for serious web surfing as it was clearly overloaded. Hi oregonfamilytravel50, and thank you for your feedback. We are currently working with another company to improve our Wi-Fi. Also our rooms are in the middle of renovations and by April 2018 they will have new everything. Thank you again for choosing and have a great weekend. Stayed here on our way to Death Valley and found it to be a very good value. Place is easy to find and conveniently located with a good family restaurant next door. Staff was extremely helpful and friendly. Room was very nice, clean and well maintained. Bed was good as was the shower and had no problem with noise even though it is on a main drag. Breakfast was standard fare but good, hot and plentiful. Thank you jmwooley for your feedback. The team and I would like to thank you for letting us know how well we are taking of customers. We are always looking for ways to improve our breakfast. Have a wonderful weekend. 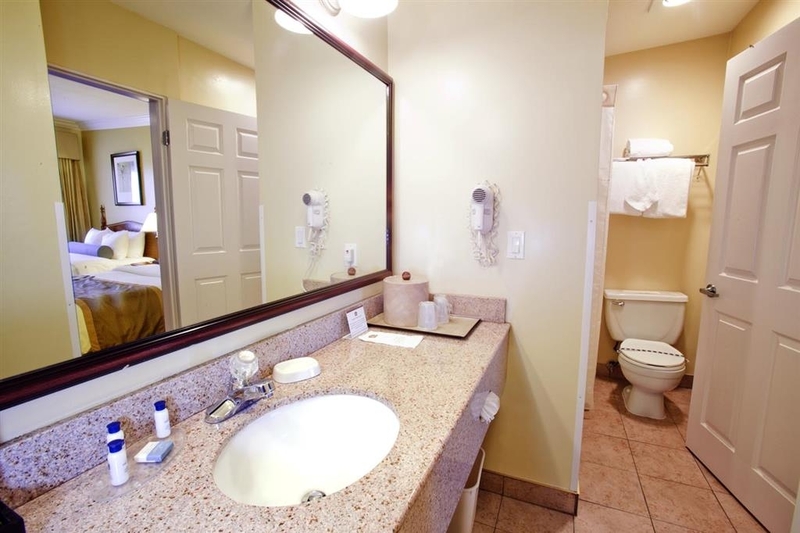 "Lots to like at family-friendly Best Western China Lake Inn!" 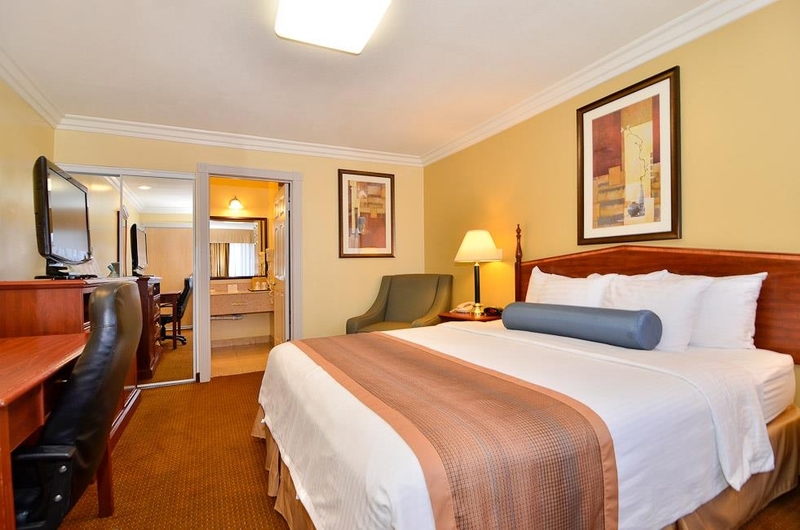 Two comfortable queen beds and a sofa in our room plus a better-than-average hot breakfast buffet made for a pleasant night's stay near China Lake Naval Weapons Station. We didn't try the outdoor pool but our grandsons enjoyed the hot tub! We also enjoyed Kristy's restaurant nearby. Highly recommended. Thank you for staying at our hotel. We are very happy that you had a pleasant stay. Staff was friendly. Hotel was clean and quiet. The wi-fi didn't work well however. Breakfast was nice. Scrambled eggs, corned beef, bacon and the usual yogart, frest fruit, rolls, muffins etc The pool and hot tub looked well kept and clean although we did not use them. Thank you so much fungramma51 for the valuable feedback. We are in the process of fixing our Wi-Fi issue. We do keep a variety of food daily for breakfast. Thank you again for choosing us and we will see you on your future stays. Have a great day. Put off by a couple of negative reviews, I chose to stay here because of their early (5:00) full breakfast, as we were taking the Petroglyph Tour which starts at 6:30. We were very happy to find the facility clean, friendly and, at least away from the main road, quiet - on a Saturday night! The room was fresh and well appointed and the price was much less than the two higher-ranked properties. Very good breakfast. Thank you so much Donald V for your feedback. We use all feedback to improve our guest experience. I am glad to hear your accommodations were excellent. Stayed overnight en route from Yosemite to Las Vegas via Death Valley. After a day long drive it was great to be welcomed by a cheery receptionist. The room was clean, very comfortable and we enjoyed a very good night's sleep. Breakfast was good, with a range of cereals, yoghurts and pastries, with scrambled eggs and waffles, etc - set us up for the day! They served brekky from 5am, which obviously suited many of those staying as when we woke up at 7, most of the parking area was already empty, which was surprising as we heard no noise from their departures. Only downside was lack of an onsite restaurant for dinner, and we had to hop back in the car and drive a mile or so to a very nice steakhouse, again well recommended by the receptionist. Thank you burdekin for your valuable feedback. It is nice to hear that we gave you great service with a smile. We hope to see you again. "Friendly staff, But inside is terrible"
This hotel is ACTULLY pretty good overall, it has good breakfast, friendly staff, and the inside is at least decently cleaned but I found a lot of things broken and such. I have a door open, broken toilet lid, and the inside overall is just poor. Hi 1340404522 and thank you for your feedback. I do apologize for the problems encountered on your stay. Did you contact the desk about any of these problems as we strive to make things right. We are currently looking at the rooms as they are next on the remodel. We hope you stay with us again and thank you for your time. It is wonderful to here that our staff is taking care of every guest every time. Thank you Peter K for taking the time to leave valuable feedback. Have a nice day. "Clean pet friendly lodging in Ridgecrest"
Stopped here for the night on our way north. Nice and clean - very friendly staff - one of the better breakfasts at a chain lodging - even has some hot options. Very friendly and helpful front desk staff. Property has a pool and hot tub which seemed popular with kids. Two suggestions for this property: earplugs for those on the first floor (people get up early and are very loud, also, you can hear every step/move the folks on the second floor make; have an extra blanket and pillows in the rooms. Otherwise great stay - would stay there again in the future! Thank you so much Nancy B for leaving your feedback. We are in our renovation process and looking to address the second floor. 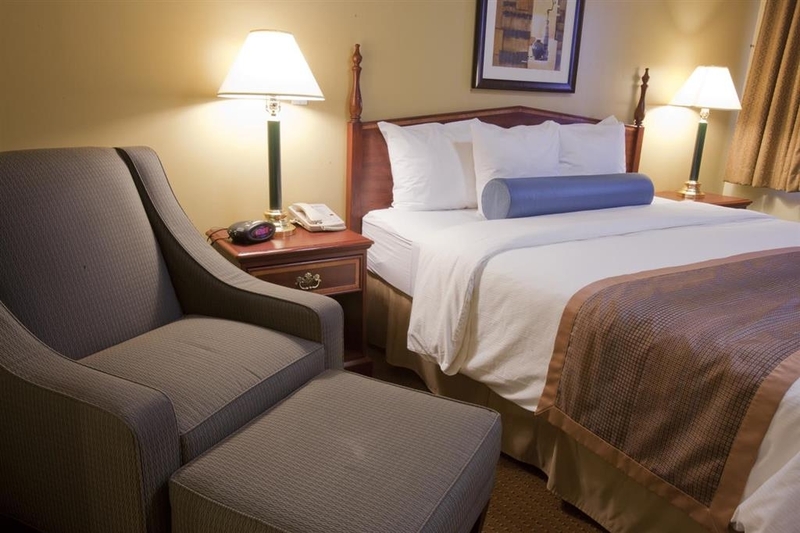 We also carry extra pillows, towels, blankets, and amenities at the desk. Have a great day and thank you again. We were on a family trip and we enjoyed our stay at this hotel. Breakfast was excellent. The room was comfortable. We noticed a whole lot of people used this facility as the parking lot was full every night. Thank you so much Cathleen H for your valuable time and feedback. It is very delightful to see that we have met the expectations of the guest. We will see you again on your next trips to Ridgecrest. Have a great week. Ridgecrest was not a destination but simply a pit stop on our way through Death Valley to Las Vegas. As such, I didn't expect much...and I didn't get it. The hotel was your typical budget rack but with a few eccentricities. For example, we spent the night expecting the people in the room above us to fall through the floor! Every step they took caused a creaking sort of crackling death rattle from the ceiling. They weren't heavy or jumping around. Also, if you stay here be very careful of the planter cut outs in the walkway. One poor woman stepped into one of them and launched herself face forward into the metal stairway leading to the second floor. There she was, knocked out in a pool of blood from a 4 inch gash in her forehead while we all frantically dialed 911. 5 stars to the paramedics for arriving promptly and mopping up the blood...but that's a different review. Breakfast, included, was so so, the eggs didn't seem real. Add the fact that the only remotely possible place to eat in this town was closed for vacation the day we were there and you can understand my rather cranky review. Also, our room stank, but to be fair, it was a pet room and we had a pet with us. We are sorry that you did not enjoy your stay at our Best Western China Lake Inn. We do need to clarify your statement about the Guest who stepped into the planter and hurt herself. We do have several Eye Witness's written statements, that the Guest was going up the stairs and either miss-stepped or lost her balance and fell down the stairs. We do thank everyone who called 911 including our Front Office clerk. We wish to thank the Paramedics, for doing a great service. "Hotel close to the Death Valley"
This is a typical american hotel. Small building (ground + first floor), parking lot in front of the rooms, typical american breakfast with waffles, bread and cereals. Swimming pool is not heated, but jacuzzi is. 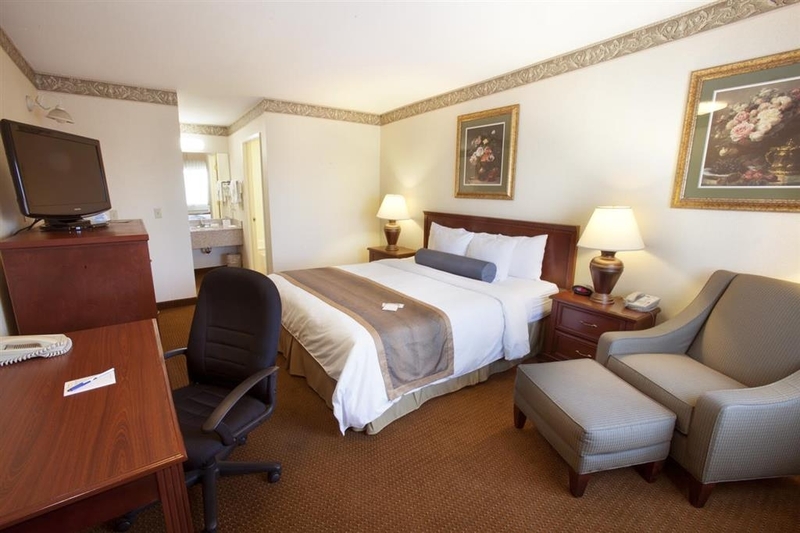 The rooms are kind of small compared to other Best Westerns, but we have family suite with a lots of space. On the other side of the street is a gas station and a few 100 meters are two restaurants. Other restaurants are at driving distance only. The entrance of Death Valley is at 70mi/120km. Not close, but between Ridgecrest and Death Valley there aren't much hotels, restaurants or gas stations. Thank you for staying with us. Your description of our hotel is very nice for other travelersl. This hotel met all my needs. 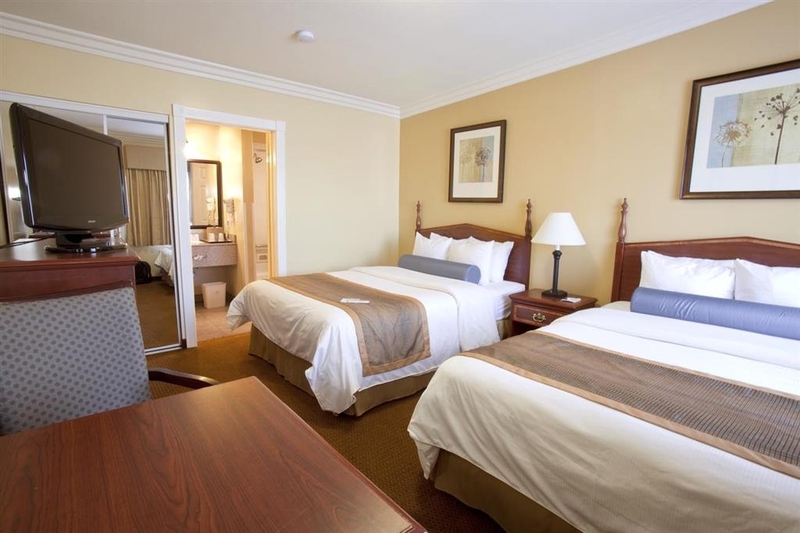 The room was comfortable, staff were professional in every way, and the hotel was well maintained and pleasant. I would recommend this hotel to anyone who was considering staying in the China Lake area for one night or many nights. Thanks to Best Western for offering quality accommodations at a reasonable price. Mr. 591douglasj, the staff and I would like to thank you for your valuable feedback. It is always great to see that the team is on track with providing exceptional accommodations for our guest. We will see you on your next trip to Ridgecrest. Have a great day. I recently stayed two nights here for the Petroglyph Festival. Loved the room! Great bed and pillows, frig plus microwave. The breakfast was to die for and I loved that they opened at 5am so I could get an early start! Scrambled eggs, sausage, biscuits and gravy, fruit, yogurt, cereal, waffles, muffins, toast, hardboiled eggs, juice..it was all there and scrumptious! The Jacuzzi was very nice as well. I could go out early evening or at night and had it to myself. Nice big tv. Internet did not connect right away but they give you an number to call and solved that problem asap. Easy check in and out and it was close to the Festival. Thank you nickbranch2016. We are always looking to provide an excellent service to all our guest. We will see you again on your trip to Ridgecrest. Have a wonderful day. The room had all the amenities I would expect from a mid-level business hotel. Comfy bed, small microwave, fridge, cable, and free wifi. The free breakfast was standard hotel fare: muffins, hard boiled eggs, 2-3 steam tray items, coffee, and juice. Not much to choose from in China Lake, so Best Western is a good option. Photos posted in other reviews were of my room so I didn't see any reason to post more. Thank you so much Swo89. We are glad to be able to accommodate your needs. Thank you and we will see you on future visit. Have a great day. Stayed here for a business meeting in town. Lobby was nice and the staff were very pleasant. However the bed was so so and the shower device to change the water from the tub to the shower did not work. I guess this is to be expected of an older property. Mr. charliepc thank you for your feedback. We are doing renovations on the property and the rooms are on the list. The in room bathrooms will be going over remodel. Have a great day. this is a very quiet and quaint community right next to the China Lake Naval Base. The employees are top-notch and very courteous and outgoing. Always eager to assist, this staff is a "looking forward to seeing again" staff. Kudos to the management team of this facility...they have a very good thing going on!!! Thank Ricardo D. We are set in making every guest experience the best it can be. This is also the reason why we have so many people returning to see us. Thank you for choosing us as your place to go and we will see you soon. Have a great day. Last minute plans necessitated taking what room was available where for one night. Have concerns about motels with external doors, but that was pretty much all that was left in town. Have stayed at other BW so gave them a shot. Staff was friendly, helpful and concerned. From the parking lot it looked like a pretty blue collar clientele. However no noise, parking lot gatherings, or footsteps on the balcony all night. Rooms were clean, comfortable and well cared for, bed was a bit firm. Did have a whirlpool tub that I did not get to use. Internet was sketchy and kept stalling, although connected. Breakfast was pretty typical, but was a hot offering, well stocked with plenty of selection. Was expecting a warmed over, painted over, worn chain property. Pleasantly surprised.. Good folks, good value. Hi Da K and thank you for your feedback. We are still going through renovations along with getting the best product for our guest. We are glad that you were accommodated they way you deserve. We will see you again on the next visit to Ridgecrest. Have a great day. This is an old hotel, with lobby under construction during my stay in march. Most important room was clean, but bedding is poor. Breakfast is a simple good old Best Western quality. During my stay in march next to my door the temporarily lobby, so a noisy night. Hi Mr Holland, our lobby has since been done and it was just the start of our renovations. The rooms are on the list and we are always adjusting the breakfast to see what would be good. All suggestions are welcome. On future travels please give us a call so that we could accommodate your stay that would be best for you. Have a great day. We stayed one night on our way to Bishop at the Ridgecrest BW. The inn is very nice with easy access from the highway and just south of the center of town. The outside looks very nice and the parking spaces are large enough you can park and still get out of your car or truck. Our room was cozy with nice art work and looks like freshley painted. The carpet need some spots cleaned and the shower head could use replacement or a soaking in Limeaway as the spray pattern is all over the place and hard to adjust. The shower head is high enough for me to get under it which is a big plus as I am over 6 feet. The staff are very friendly and efficient and our check in and check out were very fast and friendly. The Breckfast area is a good size with the full free hot breckfast. Eggs, Bacon, waffles and all of the normal cold items BW offers at breckfast. The lady in charge of the eating area was very helpful with people not familiar with the waffel makers and kept everything full even with almost a full crowd of people eating. The one negative is the noise from the upper floor, we could hear every step in the room above. We need to be on the grouned floor as we can not haul all of our stuff up stairs and they did get us a room at ground level but there does not seem to be any insulation in the ceiling of this older motel. We plan on several more trips to this area this winter and will be staying at this Best Western. Thank you again for your comments. The front was the first part of the renovation and there is still more to come. This Best Western has very nice large parking stalls. The outside looks nice for being in the Desert and was vewry clean. Our room was back from the highway so the traffic noise was low but the noise in our room from the upper floor was quite loud. The decor was nice and the room was clean except for many carpet stains. The bathroom fixtures worked well except for the shower head that I could not adjust and sprayed in all directions. The breckfast is the full BW hot breckfast with waffels, eggs and bacon along all of the standard cold breckfast items. I will pick BW because of the free breckfast over a cheaper motel without a full hot breckfast. The noise from upstairs is the only real negative for this Best Western stay but my wife and I can not haul all of our stuff up stares. I have at least two more trips to this area this winter and will come back to the China Lake Inn on our upcomming trips. Thank you 707clayg as we are going to be working on the instillation above bottom and top floor. It is part of our renovations that will be going on through April 2018. Also with your luggage we have no problem assisting you with your bags to your room. Just let us know. Have a wonderful day. "Best Western China Lake Inn"
We thoroughly enjoyed our stay here. 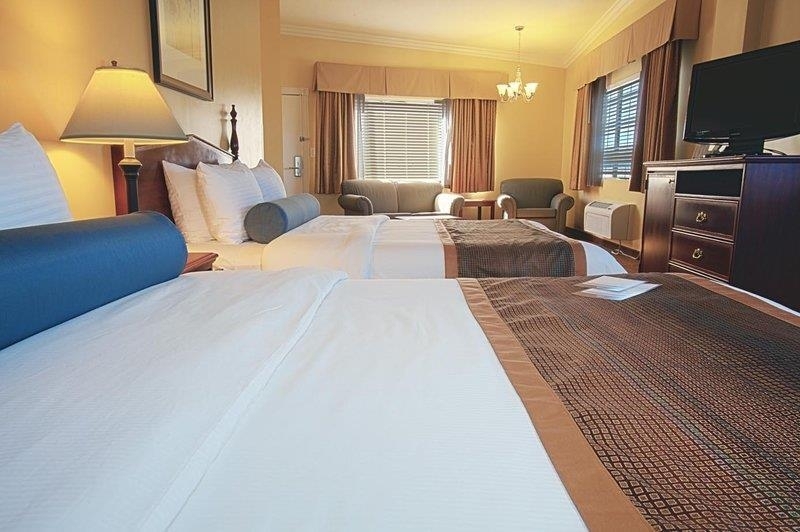 The room was clean, the staff were friendly and helpful. The continental breakfast was one of the best we've had. A big thank you to Jim for the route guidance to Death Valley, saving us a great deal of time over a different route which had been suggested to us!!! It is always great to hear that the team is taking care of every guest. Jim does know a lot about death valley and is excellent at time frames for going there. We are very happy to have him on board. Have a great day. "Ok Motel for quick overnight trip"
The hotel staff was friendly and nice and breakfast was a nice variety and started at 5 am which is great. Rooms are small and seem like they need to be renovated. Everything was pretty clean. We stayed for one night but I would not stay for multiple with 4 of us in one tiny room. Price was a bit high for quality. Thank you for your comments. We are going to be renovating the rooms very soon. We hope to see you again in the future. Also we do have bigger rooms like are two queen deluxe, and the business two queen deluxe. staff always knows what they are doing and is courteous. Wish some other hotels were this competent. Place is always clean, quiet, and I can't count the number of times I've stayed here over the past 20 years. Thank you Mr Thomas for making us your place to go to in Ridgecrest. We aim to provide excellent service to every guest every time. We will see you on your future journeys to Ridgecrest. Have a fantastic day. "Forget this place if you need high speed internet." We have stayed here several times. Never any problem. Room is spacious and clean. NOTE: my husband says they have "an ancient ethernet connection . . .need a cable". Breakfast begins quite early, which is good. Thank you piperbell for your feedback. We do offer Wi-Fi along with hard wire as everyone has there own preference. Thank you for your repeat business and we will see you again on your next stay in Ridgecrest. Have a great day. "Good place to stay in Ridgecrest"
Ridgecrest is a little out of the way, but on the route to the Eastern Sierras, Death Valley and other destinations. While there are more options than in the past, I have a fondness for the Best Western China Lake Inn. It is clean, comfortable and reasonably priced. After a week of camping, I really appreciate the pool and spa! pbwebb3 thank you for your repeat stays. That tells us how great the staff is doing. We thank you for your business and will see you next time around. Very much enjoyed a pleasant stay in Ridgecrest, The room very clean, nice breakfast, quick in and out processes, great people. The internet was very fast and easy to use, which is always an issue when traveling. Like the coffee always available too. Stephen H, We are glad to hear of your pleasant stay with us. We have recently upgraded our server for the Wi-Fi to provide a better service with internet. Thank you so much and we will see you in future stays. Have a nice day. The facility is modest, as is breakfast, but the staff is extremely helpful and friendly. This, together with the very reasonable price and its location, makes it worth coming to this Inn. The rooms are of average size, the carpet dirty and smelly as it is in most inns. Hi alexa07858IJ, thank you for leaving feedback as this will help us to further improve are staff and operations. I do apologize for your rooms carpet smell as this is not standard for our hotel. We will see you again on your next trip. Very friendly staff. Rooms very clean. Pool was refreshing. Free breakfast was "ok". Typical free breakfast. They need to invest in sturdier plastic ware. Location was centrally located. Felt safe. Very busy - make sure you make a reservation. Room to park U haul trailers. Shelley B thank you for choosing our hotel. We are always looking into to different ideas and suggestions when it comes to breakfast. So all feedback is invited to help us improve more. Thank you and we will see you if your travels should come through Ridgecrest again. 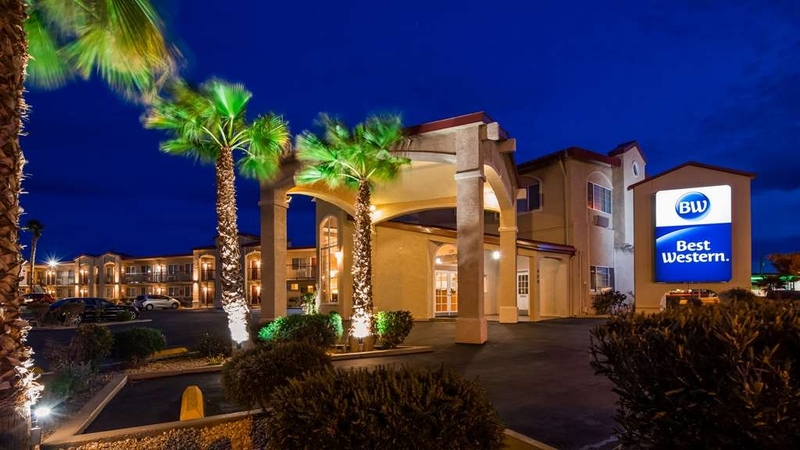 "Great choice in Ridgecrest, CA"
Excellent Motel with all the amenities, and a great breakfast early in the morning for an early start. Cool rooms away from the intense heat. Convenient to the Navy base and lots of good restaurants. We enjoyed great food at Schooners. Passing through this little town I was pleasantly surprised by the hospitality and service provided by this Motel. The front counter person was welcoming and accommodating. The room was clean and well appointed. Considering the age and location this hotel is doing very well for it's self. A perfect stop over from West Coast to Flagstaff. If you interested in US Navy this is place to go,although we did not go. The hotel was top quality as always. Breakfast was so well laid out. Had dinner in Denny's just up the strip. Our room was top floor facing the setting sun, beautiful. Tina on reception went through all the details. Brill customer service, the lady doing breakfast was always keeping things tidy. The pool was clean, tidy and lovely & cold. Well worth $110 we paid, all taxes inc.
We stayed in 5 different hotels in 5 days as we were traveling from Washington to California. Of all the hotels we stayed in, the Best Western was THE BEST hotel we stayed in. Our vehicle had a mechanical issue in the parking lot of the Best Western. Because we had no where to go or nothing to do while it was being repaired across the street at the Ford dealership, we requested to check in early. They allowed us to check in earlier than normal and gave us a fantastic room. The room was obviously updated recently, well taken care of, clean and had little touches that made it feel more welcoming. We have 4 children and the family suite they gave us was directly over the office/lobby. They expected us to be a little louder because of the "pitter patter of little feet" and even seemed to enjoy the sound. The breakfast room was fantastic and well stocked. There was such a wide selection of breakfast foods including biscuits and gravy and blueberry waffles! The young lady that was working in the breakfast area was so friendly and knowledgable about the town. All of the staff was very kind and friendly. 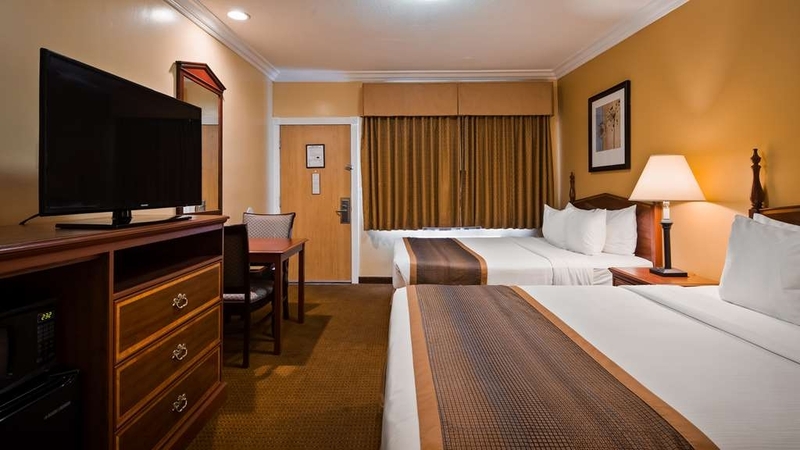 We will definitely stay there again and only recommend the Best Western to our family and friends. The staff were all very nice, from the front desk to the young lady in the breakfast room. The breakfast was very good. The room was clean but very small. The front door was not hung correctly or was broken - it had a large gap on the bottom and lower side - large enough for insects to come through. The Wi-Fi did not work. There was not a connection to internet as if the router was not working. I would say the staff was above average but the room was only average. The hotel is non-smoking in the rooms but people were smoking right outside their doors or on the steps of the stairs leading to the 2nd floor. This is the eighth time, in the last ten years, that I have stayed at the Best Western China Lake Inn. Apparently this property is under new management. Once again, my family and I had a late arrival, getting into Ridgecrest at around 1:30 a.m. I was looking forward to sleeping in and still make it to breakfast by 10:00 a.m. on Saturday morning. Unfortunately, I was told that breakfast on the weekends was now only until 9:00 a.m. So we got out of bed just before 9:00 a.m., and arrived in the breakfast room. It was packed with people at this time. Apparently other guests wanted to sleep in and then get to the complimentary breakfast before it closed. The good news is that it was a full breakfast. Nice selection with a courteous hostess. My family stayed in two rooms for three nights. I had room 201, which is a large suite with two queen beds. My 89-year old mother stayed in room 104, which is mobility accessible with a roll in shower. Both rooms were clean. Upon checkout, I walked to the front counter and handed the desk clerk my room keys. She handed me my two room receipts. She informed me that my credit card had already been charged the prior evening. I informed her that I had planned to pay with my Best Western travel cards. She informed me that I should have said something at check-in, otherwise they automatically use the credit card. I stated that in my over 500 stays at Best Westerns, I was always asked at checkout if I wanted to use the credit card on file to pay for the stay. ( I just found out from Best Western International in Phoenix that my total separate stays at various Best Westerns is 559.) The lady then said that other guests had complained at checkout that they wanted to use a different method of payment other than the credit card presented at check-in. I then stated to her that this was a clue that upon check-in, the desk clerk should ask the guest what form of payment would be made at checkout, and note the response. The front desk lady implied that it was my fault for not informing the property at check-in that I would be using a different form of payment. How could I inform someone regarding this establishment's policy that I knew nothing about? To be clear, in my 559 stays at various Best Westerns, I have always been asked by the front desk clerk at checkout if I would be using the credit card that they had on file or a different form of payment. 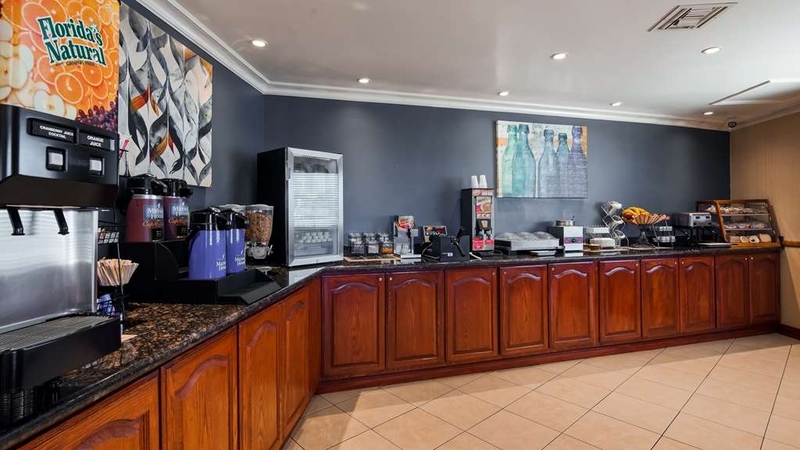 In sum, as the title of this review states, be aware of this hotel's payment policy, plus the breakfast hours on the weekend that is now 9:00 a.m. instead of 10:00 a.m. Besides these two issues, it was an acceptable stay at the Best Western China Lake Inn in Ridgecrest. I pick Best Western for their consistency and once again we were totally satisfied with our accommodations. This is a busy property so for the purposes of staying one night it fit the bill. The rooms are small but what I care about is cleanliness, water pressure and a friendly staff. "Pets okay but not pet price friendly"
Charging per pet instead of for a pet room is not standard industry practice and is excessive considering little or no extra labor is required to clean the room, especially when both dogs are very small, one's a poodle (no shedding) and I bring mats for them to sleep in. Would not recommend this place if you have pets. Better options elsewhere. "China Lake Best Western, Ca"
Excellent staff and accomodations. Complimentary breakfast was very good and important to start my day off right. We stopped in without reservations and were offered a room on the first floor with a kink size bed. What more could we ask for. Very satisfied with everything. Mr. Lee P thank you for letting us accommodate you. It is so great to see that we continue to provide the best service that every guest deserves. If your travels lead you this way again we will be here for you. 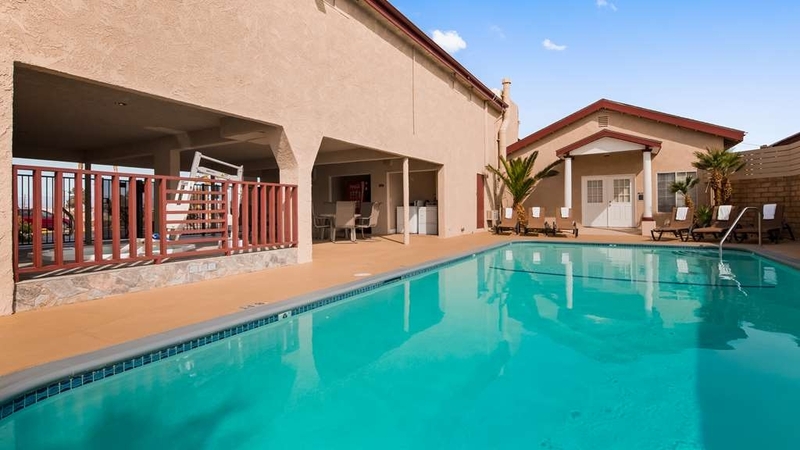 The West-Bestern in Ridgecrest, California, is a great place to stay! I have stayed there often in the past and plan to stay there many times again in the future. I can't say enough about how enjoyable my stay was and I hope I meet my two hundred word minimum real soon as I'm getting tired of doing surveys. I like the Best Western hotels much better than doing surveys about them for advisory firms like this one I'm writing for now. One, two, three, four, five, six, seven, eight, nine, ten, eleven, twelve, thirteen, fourteen, fifteen, sixteen, seventeen, eighteen, nineteen, twenty, twenty one, twenty two, twenty three, twenty four, twenty five, twenty six, twenty seven, twenty eight, twenty nine, thirty, thirty one, thirty two, thirty three, thirty four, thirty five, thirty six, thirty seven, thirty eight, thirty nine, forty, forty one, forty two, forty three, forty four, forty five, forty six, forty seven, forty eight, forty nine, fifty. There, that's enough for now. I'm tired of writing and they're not paying me enough to write a longer review than this. I quit! Thank you so very much Joseph for taking the time to complete our survey. We will see you in the near future. I'd have to say the staff was very friendly and welcoming and overall this BW was clean and offered good service. This hotel is better than the average rating I gave it, but I hesisitate to say it was very good for a couple of reasons: 1. The AC unit is a wall unit that does not really keep up with the 108 degree weather, and it's VERY noisy. Additionally, in a room with 2 queens, one of the beds was squished right up the unit, and the person in that bed was always cooler than the rest of the room. This makes temperature control in the room difficult. I think this is a product of squeezing two queens into a room meant for 1 queen or 1 king. 2. The bathroom in really cramped because the closet is cut out of the bathroom and there is little room to move around. A minor complaint is that the floor tiles were loose right at the door and creaked as you walked into the bathroom. 3. The breakfast was so so. One morning, we were down there at 5:15am, the first customers, and the eggs were formed into a big bread loaf and was pretty much like a nice dense log. (Aren't logs reserved for yuletide greetings or something?) What happened to light and fluffy? 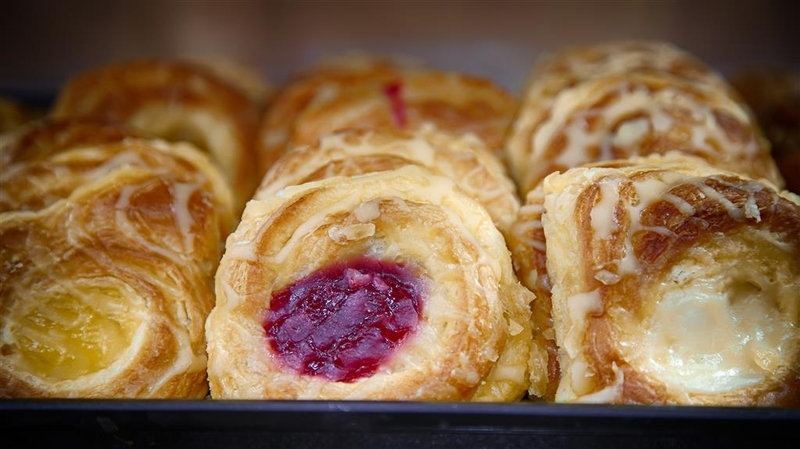 Lots of sweet, prepackaged, sugar-rush danishes of an off variety too. I don't really eat corned beef hash, but the one they offered looked like it came from a can...not so appetizing. The coffee is pre-made and sitting in Maxwell House thermos dispensers. But, there is a good selection of breakfast stuff...just not the healthiest. Hi MuseofLife and thank you for your survey and details of your specific problems. I do not know if you have stayed with us previously but we are in the middle of our renovations. We will use this feedback to better the guest experience. We are working on other breakfast options all the time. Have a great day and thank you again. "Nice Place. 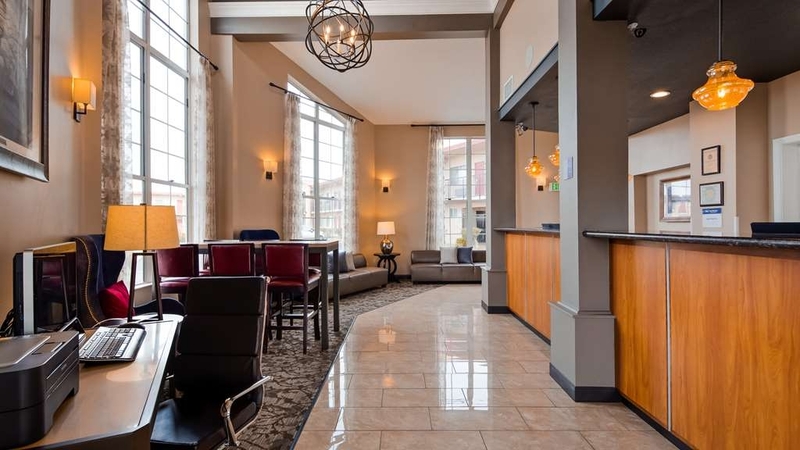 Staff was very helpful"
Glad to find that this hotel had a vacancy on Memorial Day weekend. But much more than that, it also had wonderfully friendly front desk people. I planned on driving to Death Valley the next day and had several questions since some of the park had had some flooding. They were able to give me more complete advice, especially about a section of unpaved road that would need to be crossed. The guest room was very comfortable and very clean. Since I traveled alone, I asked for a second floor room for security. There are outdoor corridors and no elevator. Someone offered to help me carry my bags up to the room. I felt safe and slept well. It was quiet and comfortable. Everything in the room worked as it was supposed to and there were adequate towels and shower incidentals. The parking lot is generous, with easy access, lit, and it is possible to park near one's room. Guest laundry is in a secured area outside near the pool area. I really enjoyed the breakfast as well, and it was a great start to the Death Valley tour day. It was about 70 miles from the hotel; I drove up through Trona. I've stayed at many Best Western's but the people made this one special. I would stay again, and I recommend this hotel. Violette54, Thank you for taking the time to provide your feedback. It is so great to hear that our staff is going above and beyond for our guest. See you on your next trip to Ridgecrest. Have a great day. A nice clean hotel room, very quiet and felt safe. The hot tub was great amenity, as well as the breakfast. I enjoyed the complimentary breakfast, many items to choose from. I would recommend this to anyone who is staying in the Ridgecrest area. The town is hot, run down and pretty barren, but there are still a few places around like this Best Western with a nice pool and a way to get out of the heat. The team and I are very satisfied that we continue to give the great service that everyone deserves. We will see you on your next journey to Ridgecrest. Have a nice day. "It's the people, I tell you." Good location. No hassle getting in or out of the parking lot or on/off the property. Tina, Rachel and Theresa, were the top of the rock in customer service. Everyone else ran a very close second. I checked in with Tina. She was the most thorough in directions around the hotel that I've ever encountered. As a traveling salesman- when I was in the business, I Never can upon anyone that was more versed in what she was doing, and the layout of the property. Thank you so much Samuel. Customer service is what we stride for because everyone deserves the best. Have a great day. 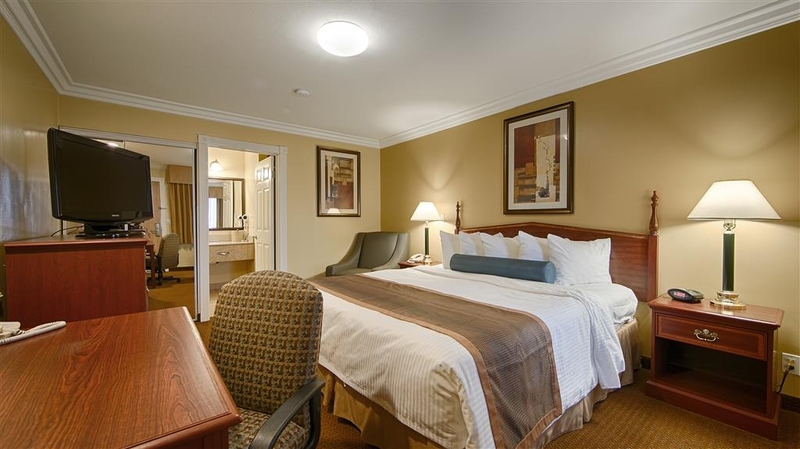 Great location as I was in town for work; room small for king bed. Closet also small with little room for luggage. Room didn't appear to have been remodeled but clean and comfortable. Pool was great as was the hot tub. Breakfast though was less than desirable. We will use your feedback as rooms are part of our remodel. We are looking into other breakfast options to satisfy our guest. Thank you for your time and we will see you on your next visit. "Jacuzzi Bath After a Day on the Desert"
This was a toally enjoyable hotel. The in room Jacuzzi Bath was especially enjoyable after a day exploring the Mojave Desert. The room was quiet and the bed was very comfortable. The extra pillows that I requested on my reservation were already in the room upon my check-in. I was comforted that the front desk was open and staffed 24 hours a day. The staff are very kind and helpful to the traveller. This was my first stay THIS Best Western and I was duely impressed. Security was high as the room key was required to access almost all the public areas of the hotel. I highly recommend that you stay at this hotel. Our team is constantly trying to bring the best service possible. Your feedback informs us that we are doing just that. I am glad you enjoyed your room along with the hospitality. We will see you again if your travels lead you to Ridgecrest. After crossing deathvalley park and beginning the day from pahrump we were happy to find a bestwestern late at night after a long drive. Thanks the bed were so comfy, room clean and could rest ourself. Afordable too !!! I discover a beautiful town to . Hi Pascual03, We are here for you twenty-four seven. I know after a long day there is nothing like getting the right sleep. The team works hard to make sure that guest get the best. Thank you for your time and we will see you the next trip to Ridgecrest. We stayed here to go on the Petroglyph Canyon Tour through the Maturango Museum. The room was a bit small but we made it work. Breakfast was wonderful--and began at 5 am! The employees were helpful and responsive. Hi Mimi. The team and I appreciate you taking the time to let us know that we are right on track with taking care of our guest. We try to accommodate every guest need. We will see you again on your trails to Ridgecrest. Have a great day. 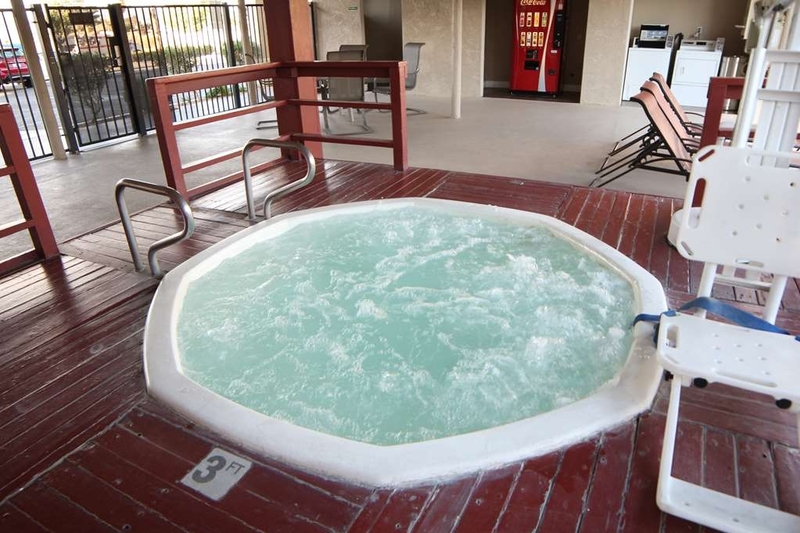 We stayed in Ridgecrest primarily due to the benefits of a jacuzzi in the room. It was clean and very delightful! Well worth the extra few bucks! We needed a roll away bed, and the folks at the front desk made sure it happened (even after I said the kid could sleep on the floor). The team is always looking to take care of our guest anyway we can. Thank you Julie for taking the time to leave feedback. I am glad that we made you comfortable as we try to make your experience "Home away from Home". We will see you on your next trip to Ridgecrest. It is always good to hear from our repeat guest and know that we are providing the exceptional service that they have come to expect. We are continuing on breakfast and remodel of our hotel. Thank you and we will see you on your next stay in Ridgecrest. I'm afraid I was disappointed at our recent stay at this motel. The room we were given had 2 queen beds, but the room itself was so small that they barely fit. The bathroom area was very strange, with a corridor by the sink so narrow that my wife and I had difficulty passing each other. The only wall socket accessible for charging our phones was too loose to hold our plugs, Two stories, outside corridors, no elevators. Breakfast was fine (the usual). This just didn't feel like a BW Plus, rating 3 diamonds in the AAA book. "Great place outside of Death Valley"
This hotel is a great place when visiting Death Valley. It was quite and cozy. The front desk personnel was very helpful and friendly. We also liked that when we came 10 minutes before the breakfast time ended, all items were still available, and we were allowed to take enough time. "Ridgecrest Best Western gets top marks"
I was on a business trip in Ridgecrest and felt so accomodated by the hospitality and overall comfort and service at this hotel, that if I came again for any reason this would be my only choice for a base from which to travel. I felt as though the service was on par with Hyatt Regency with a range of daily newspapers, complete free breakfast and ample bathroom amenities. Top notch and veyr comfy beds. The excellence began in booking the trip in whcih we had to make some changes which were compeltely satisfied due to the care of the front desk associates. Thank you Vince for leaving feedback. We appreciate every guest and strive to go beyond their expectations. It is good to see that you confirm that we are doing just that. We will be here on your journey back to Ridgecrest. We wish you well and will see you. "A bit yucky.... for the price." We chose the best western based on trip advisor reviews and price. I would say this place is really a bit better then poor but not quite average. Next time we'd pay more and try the Hampton Inn. The place is run down, the room was musty and I would recommend trying another hotel. I would like to apologize for not meeting your expectations for your stay. We are in the process of renovating our hotel. I would like to know if you notified our front desk of the musty atmosphere of your room? We do take great pride in customer service and value guest feedback. If your travels lead back to Ridgecrest, we hope you will give us another try. Thank you for your time and feedback. Tina at the front desk had great service and was very nice and insightful! Plus I couldn't say enough about the bed and pillows I was sad going back to my own bed! Only thing negative is this town doesn't have much to eat at the light night hour! Thank you for your time and compliments. We try to reach each guest expectations and it looks like we did that for you. Thank you again for your time and we will see you on your next trip to Ridgecrest. This is a typical American hotel. Small building (ground + first floor), parking lot in front of the rooms, typical American breakfast with waffles, bread, ... swimming pools. The rooms are kind of small compared to other Best Westerns. On the other side of the street is a gas station and a few hunderd meters there are two restaurants. Other restaurants are at driving distance. The entrance of Death Valley is at 70mi/120km. Not close, but between Ridgecrest and Death Valley there aren't much hotels, restaurants or gas stations. We would like to thank you for your feedback. If you should need further assistance we are here for you twenty-four hours. We used this hotel as we were on a road trip to California, Arizona areas. It was a great find. We had a queen room, it had two queen beds, microwave, fridge, coffee machine, it was spotlessly clean. We stayed for 2 nights, there was complimentary breakfast which included hot scrambled eggs and sausages, as well as pancakes, toast, pastries, cereals etc. The staff were very helpful and courteous, nice hotel. We walked to local restaurants and bars from the hotel, it was about 10 minutes walk, so the location was great. From the staff here at the China Lake Inn we thank you for choosing us out of all the places available. We hope to see you again on your next trip to Ridgecrest. "Cheerful and enthusiastic staff; noisy room"
Our request for a particular room was met enthusiastically and cheerfully by the receptionist - Thanks! We had a burnt-out lamp, which was replaced instantly - Thanks! We had a very noisy neighbor above us - noise insulation side-to-side was great. Up-to-down not so much. We take great pride in taking care of each guest and making them feel like they never left home. Thank you for choosing our establishment and we hope to see you on future trips going through Ridgecrest. "Comfortable night, with excellent service"
Great hotel with lovely rooms and very comfortable beds. The staff were friendly and helpful. When I stayed there were Ridgecrest was swarmed with a bug infestation sweeping across California but the hotel was prepared with information for the guests and spare towels to make sure there were no gaps under the door for bugs to get in. Free breakfast was also great, although some German tourists had to let me in because the key card did not work in the door. Just a one night stay which was comfortable and without problems, the hotel is clean and well looked after with a good and plentiful parking area, room was fine everything worked as it should, we also made use of the on site launderette facility's which were excellent and cheaper than most other hotels we have visited, the hotel is located close to a busy road but we didn't experience heavy traffic noise in the room and had a goon nights sleep. Dogs WELCOME!!! No doggie smells!! Good job Best Western! 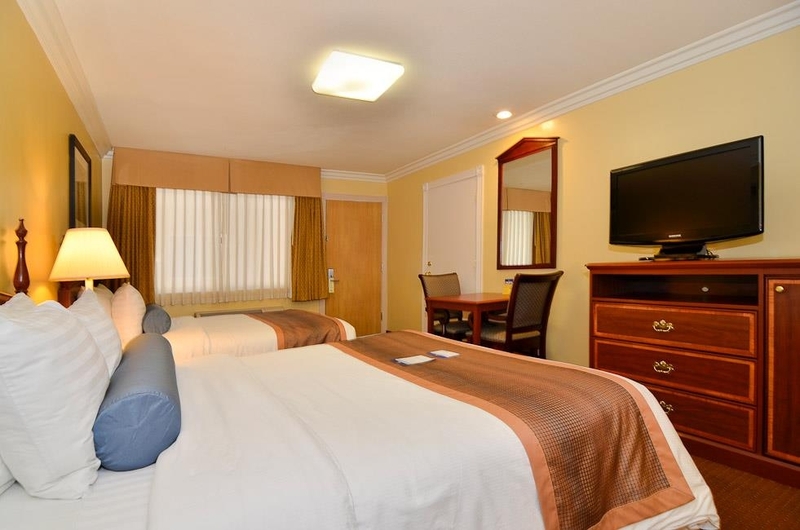 Very clean rooms, courteous, helpful staff, something for everyone full breakfast. We will be using Best Western for more of our travels in the future. As long as you checkin with low expectations, you'll be okay. Rooms are quite small and outdated. The free breakfast marginally makes up for some shortcomings. Don't expect a workspace in this property unless you call lying/sitting on you bed as a workspace. Very nice reasonable priced hotel. Excellent breakfast options, including make your own waffles. Has a spa and pool available. Very caring staff on duty. Coffee in room with a decent size fridge, for a hotel. Easy access to the Naval base or back to the highway. "Only stay here if you have to!" Stayed here for one night. Luckily they gave us a room on the upper level. Extremely noisy. People coming and going all night long. This is an exterior corridor old style motel so anyone arriving late/ leaving early in their car will keep you awake. Breakfast not worth having unless you're desperate although juice was good. Staff disinterested. No one bothered asking if we were satisfied when checking out. Stay elsewhere if you can. "Good quality, affordable, business hotel." One of the most noticeable aspects of the hotel is the efficient courteous staff. I never felt like I was interrupting them. They were always there to help. I found the room clean and well equipped, but those rooms with 2 double beds are a little cramped for space. It has plenty of convenient parking and many restaurants close by. They serve a good basic breakfast with morning USA Today. "Spotlessly Clean and Pet Friendly"
We try to make a lasting memory for every guest. 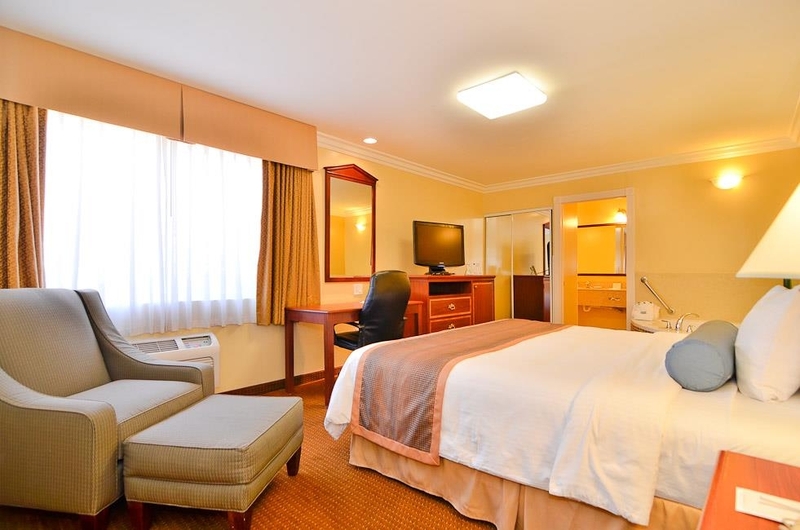 Everything from the front desk, to housekeeping, to maintenance we provide excellent work. Thank you for your feedback and ensuring us that we are doing excellent work. "Pleasant Stay with Excellent Value!" 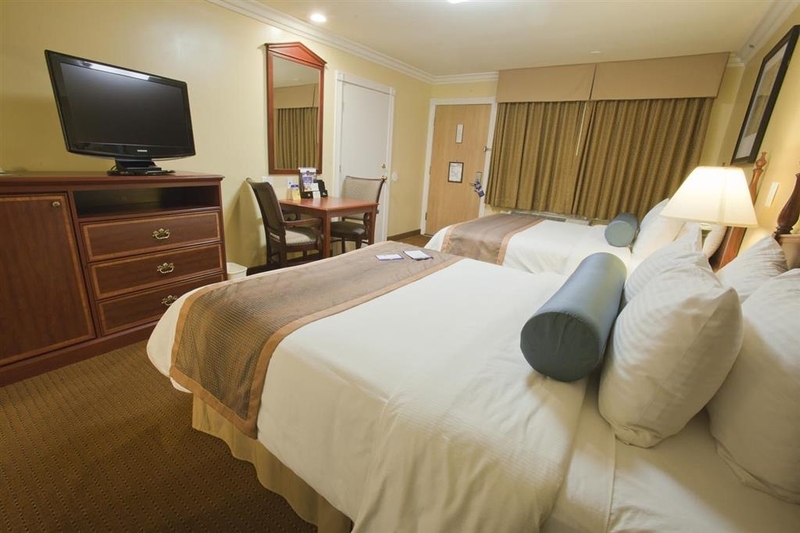 The Best Western China Lake Inn is our go-to place when we visit family in Ridgecrest. 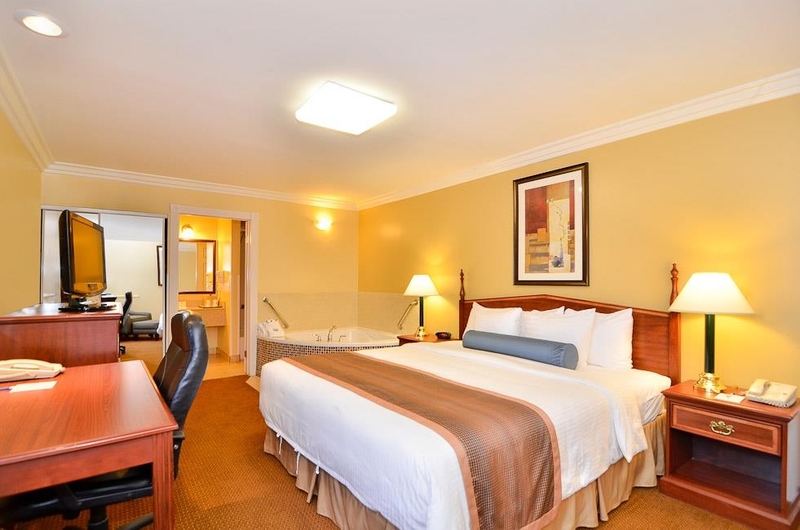 It is very clean, the beds are comfortable, the breakfast is good, and is what you expect of a Best Western hotel. Highly recommended! The staff and I appreciate that we are your place to go in Ridgecrest. Everyday we looking into ways of making the guest experience even better than the last. Thank you for your time and we will see again on your next trip up to Ridgecrest. We stayed at this hotel as an overnight stop while driving to Pahrump. 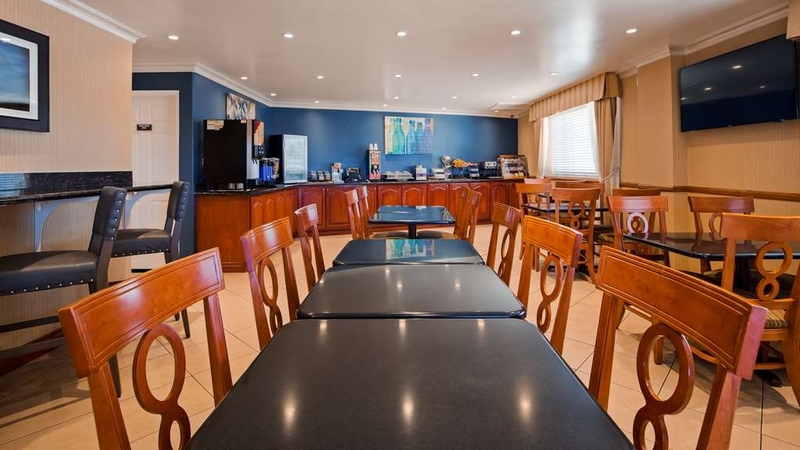 Rooms are small but well equipped.The breakfast food was just OK ,Free WIFI was good Staff were very helpful and friendly , overall this hotel was a good value. Thank you for your feedback. We are looking into other alternatives to add to our breakfast. Feedback is so important because we can see where we need to make improvements. Again thank you for your time. We arrived late afternoon after a seven hour detour due to Death Valley being shut down. Deidra was awesome, welcoming and very helpful. Hotel room was comfortable but would definitely recommend requesting a second floor room if possible. Breakfast was included in price and satisfactory. Great for a one night stop. It is great to hear that we are taking care of our guest. We believe that each guest is a main priority and want to give them a great experience. Thank you for your time to complete our survey. "Great for stay over before or after death valley!" Great place. They were having a beetle infestation in Ridgecrest but staff had sorted it so that the rooms were clear. Very friendly staff. Convenient parking. Very handy for driving on to Death Vallley. Thank you for your comments. It shows that we are looking out for our guest and giving them the exceptional service no matter what the situation is. We are glad to hear your accommodations were to your satisfactory. If you ever need to book a future reservation when heading to Ridgecrest, just give us a call. Stayed here on our bike tour around Nevada and California. Good value for money, nice rooms and nice outdoor pool. The breakfast was OK and the staff at the reception was very service minded. Easy to access from the nearby roads and several places for dinner just "around the corner". "Clean, friendly, close to work"
I chose this hotel because it was close to where the meeting was held, and easy to find. I'll probably stay again, because it was clean and neat, the staff was friendly and helpful, and it was a comfortable and pleasant stay. The price was right and so I took my chances on another Best Western. It was mostly what you would expect for a motel of this kind. The staff was friendly. The room was clean and a bit nicer than expected. Free wifi and breakfast is good. Tina, greeted at the front desk and welcomed me back. Confirmed my reservation, and explained all the amenity's, and assigned me a clean and comfortable room, great job. Will stay at this any any other Best Western as I Travel. "Hot time in High desert"
room was clean but occasional beetle showed up based on an area wide infestation, harmless creatures and only two in the three day stay. overall comfortable and within reasonable pricrange for the area. Very clean, super friendly and helpful (especially Tina from the frontdesk). 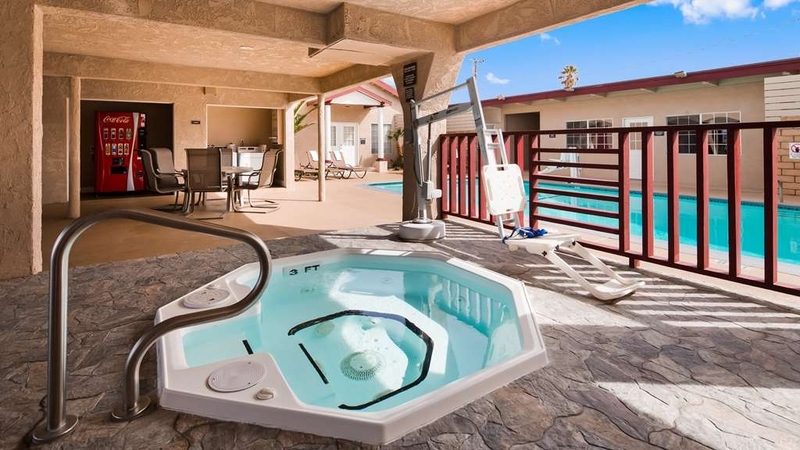 It has everything you need and more (with whirlpool and pool). Great diner right around the corner withgood food to a great proce. I would stay there any time again! Had a super night there. Great hotel, clean, updated furnishings, and Tina at the front desk was super friendly. As an ex hotelier, I would have loved to have her working for me. We'll definately be back when traveling through here again.